Type of dive: Can be done as a shore dive but recommend doing this as a boat dive. 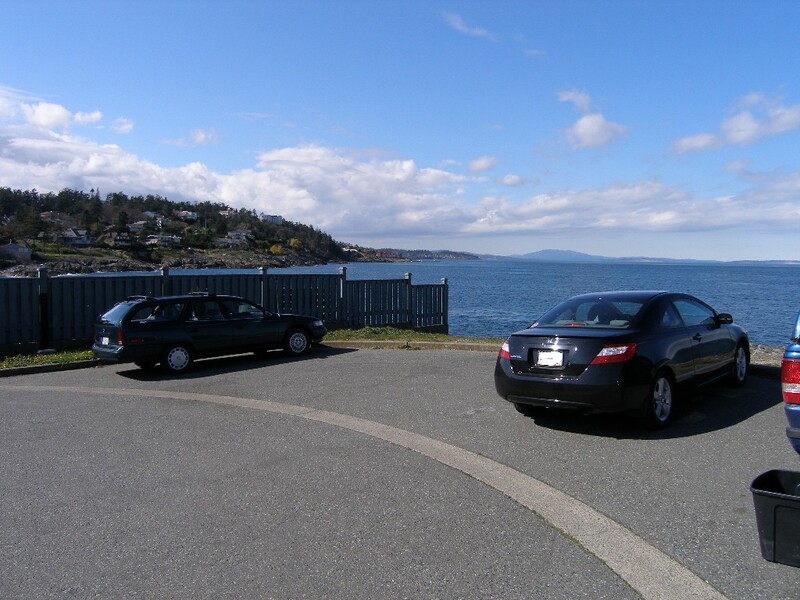 Accommodations: There are several places in Victoria that you could find lodging at. Including Hotels, Motels, Inns and Bed & Breakfasts. 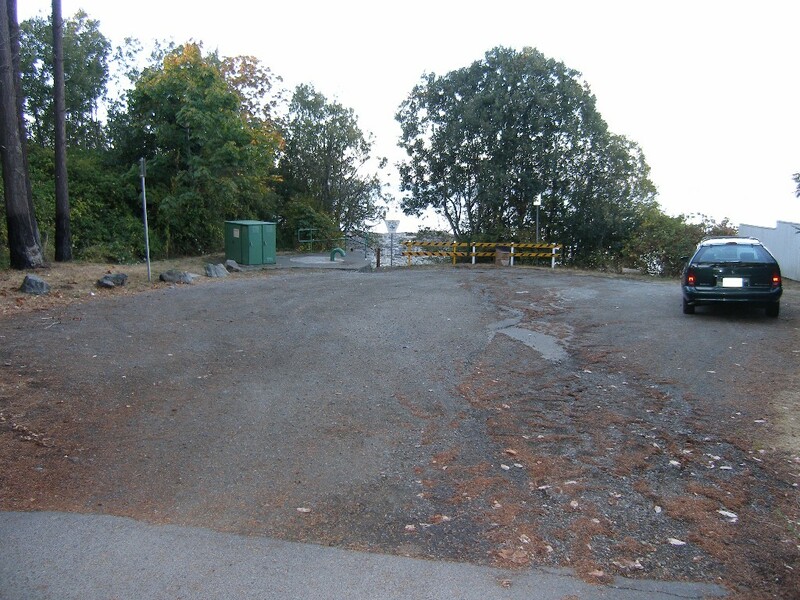 Hazards/Obstacles: Current is almost always a hazard here. Some protection at Spring Bay side but not at the wall. 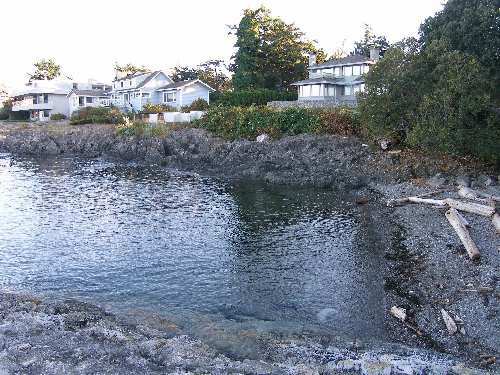 Sensitivity to tide/current: Very high current area. 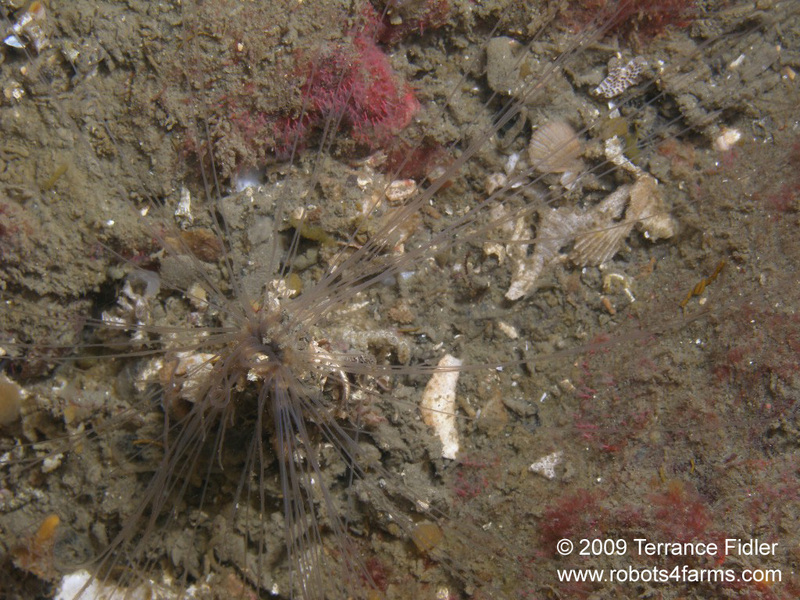 Ten Mile Point has more Sea Anemones and Sponges than I've ever seen any where before. 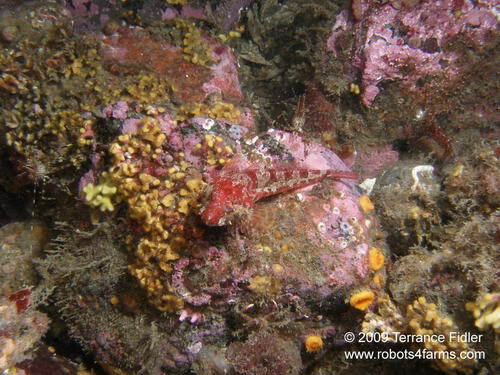 This is due to the currents at this location. This is a very dangerous place to dive. Use Extreme Caution. Ten Mile Point proper - very tricky getting into the water here. 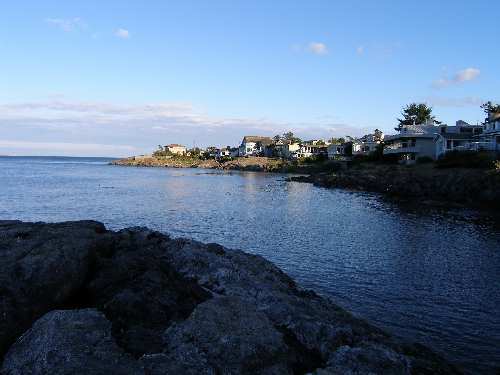 Spring Bay - very easy getting into the water here. 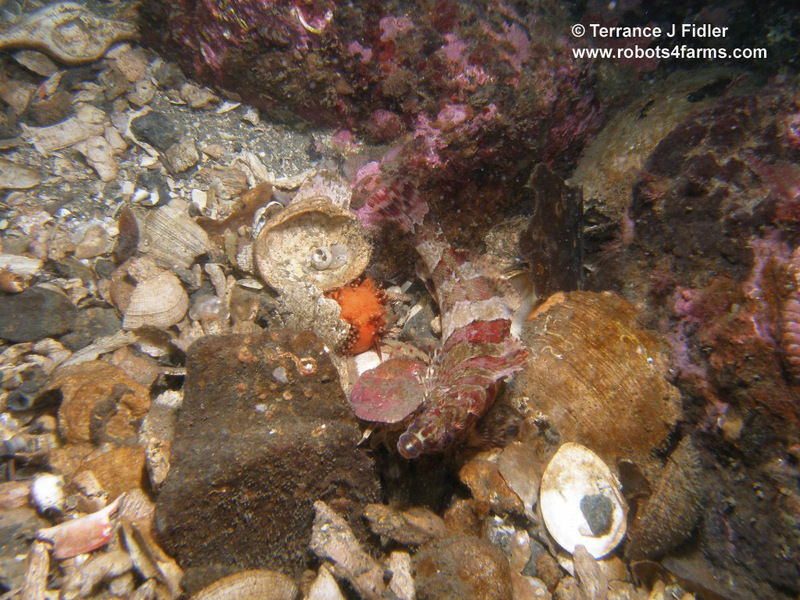 there is lots of stuff to see in the shallows. 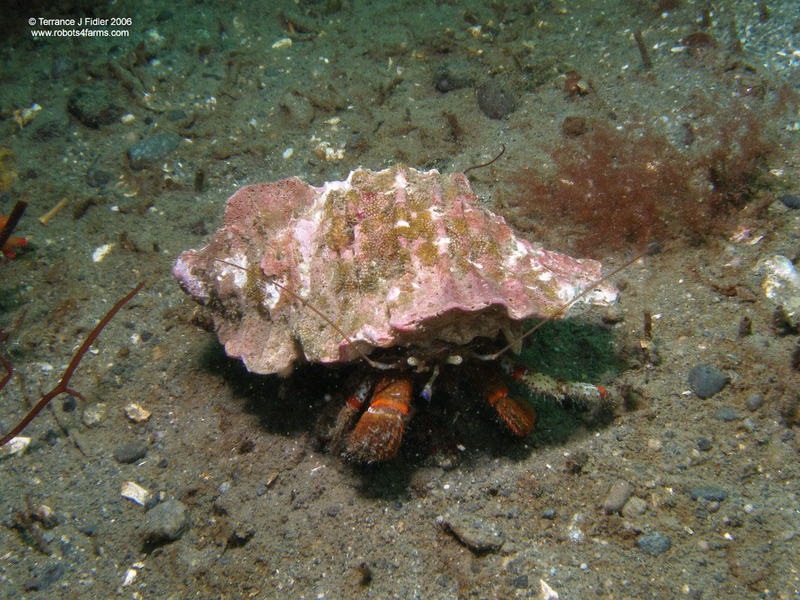 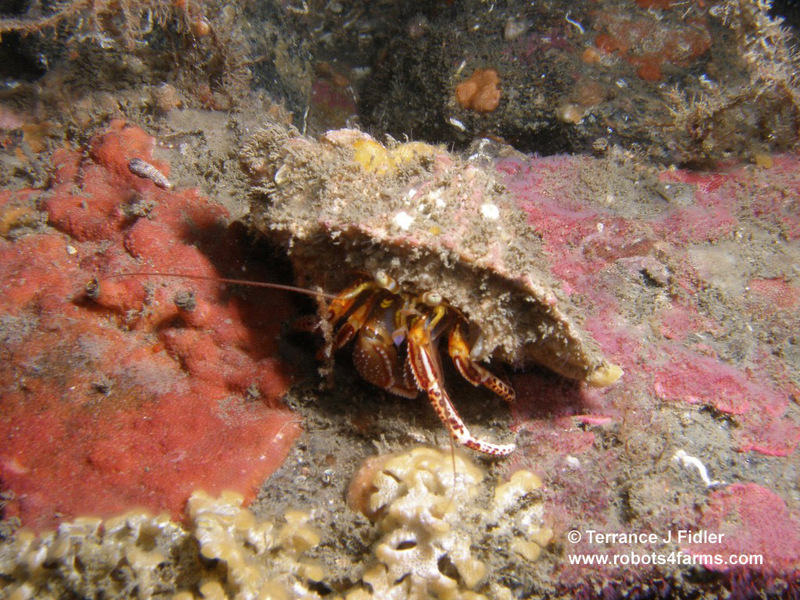 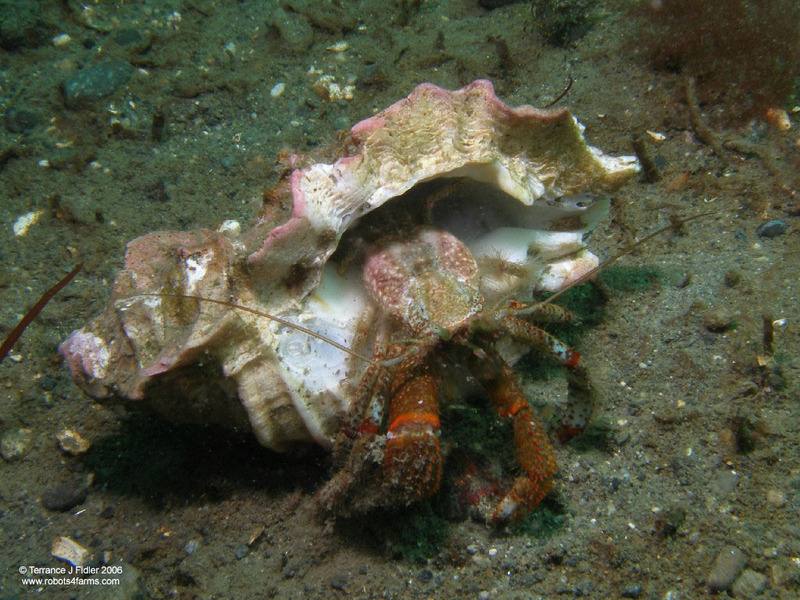 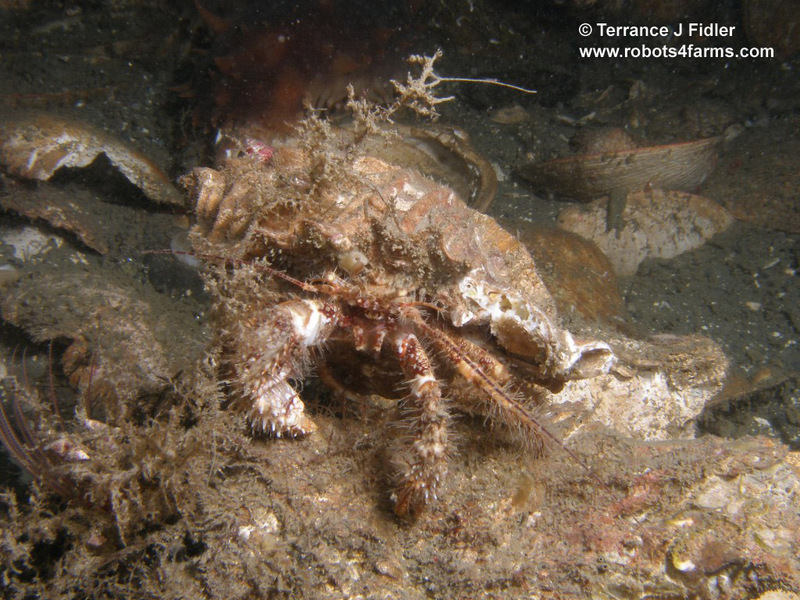 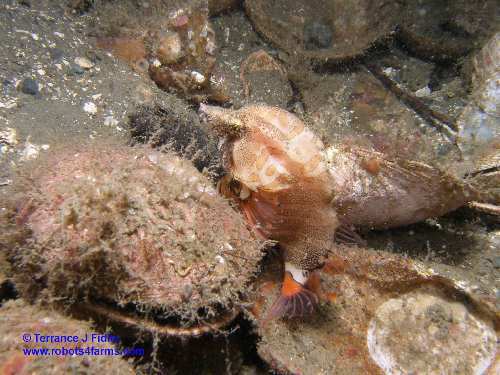 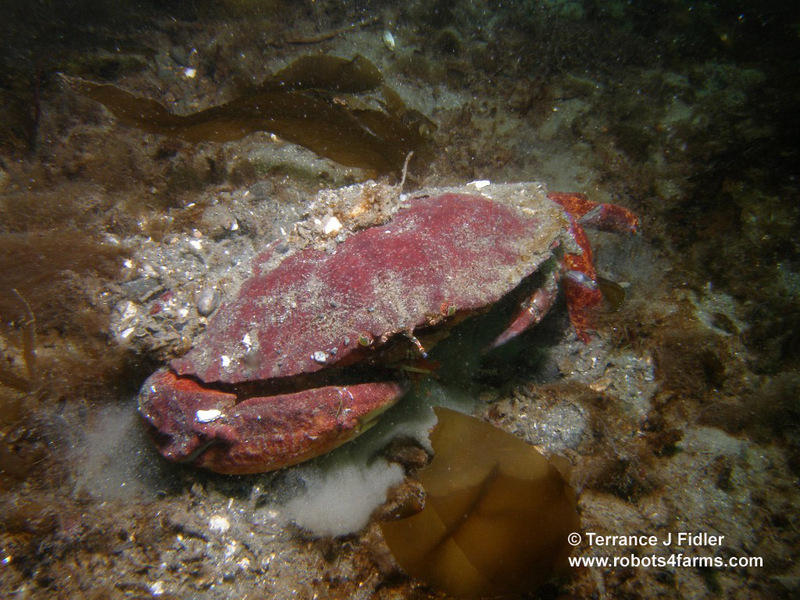 Bering Hermit Crab - same hermit crab now part way out of its shell. 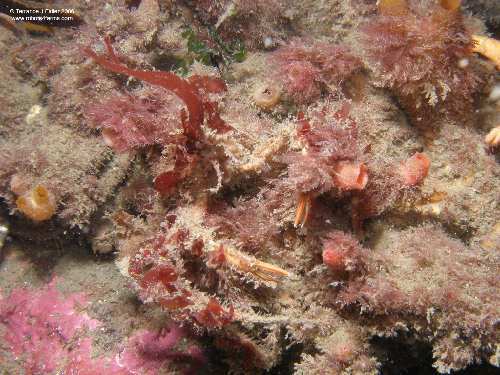 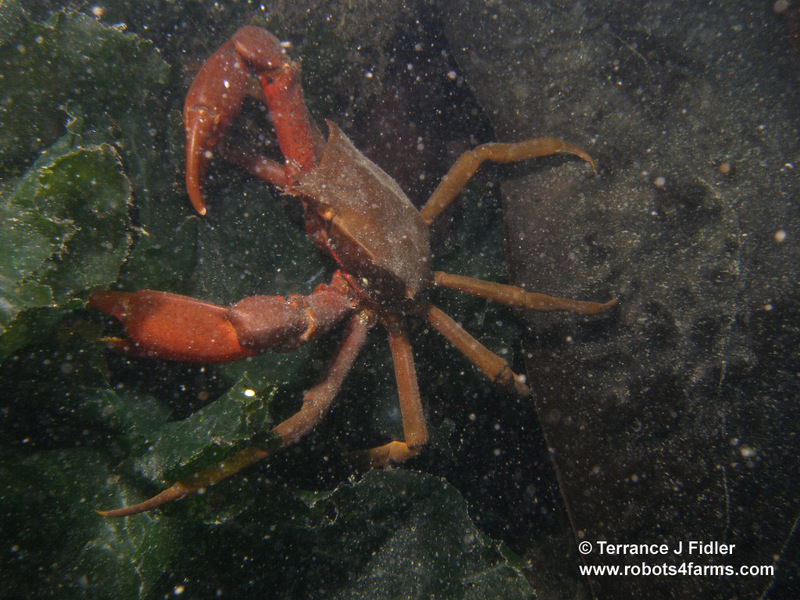 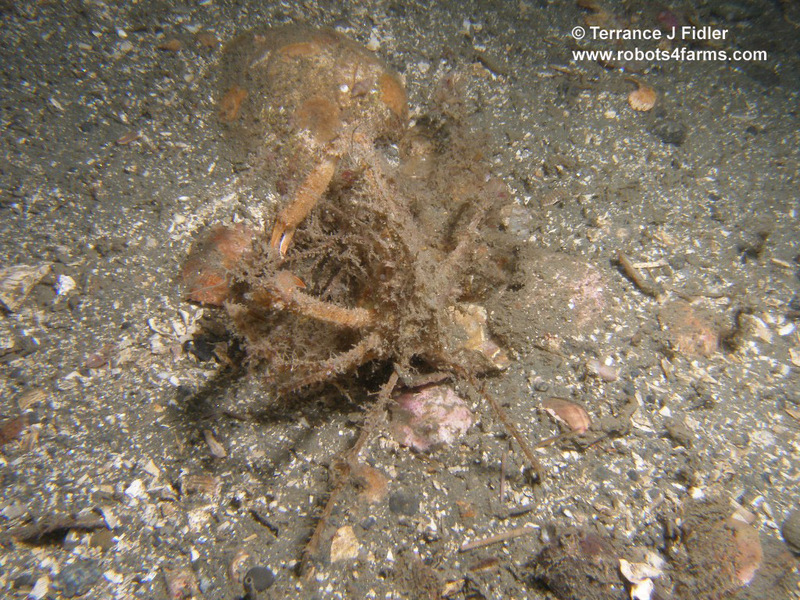 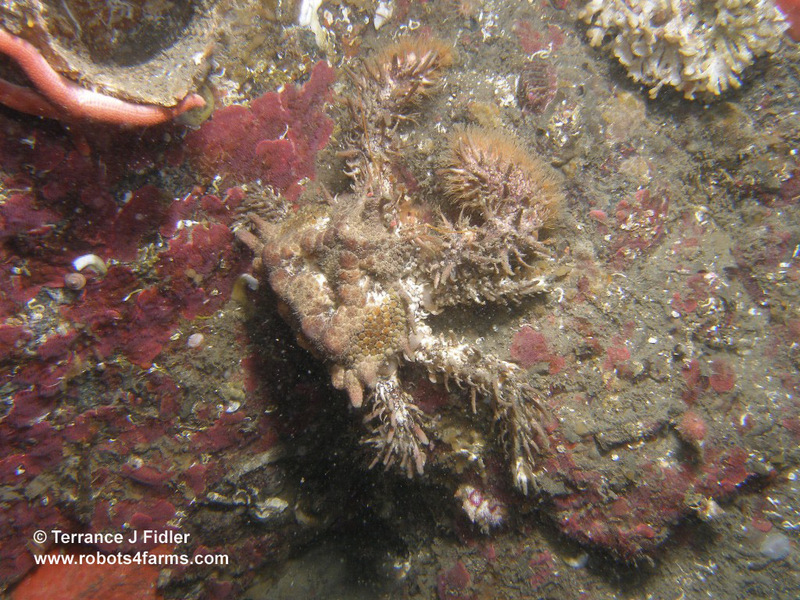 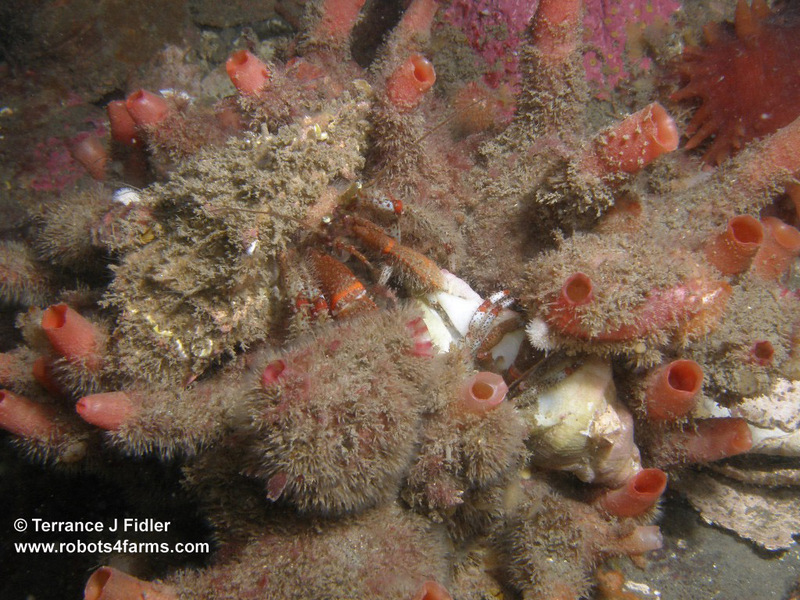 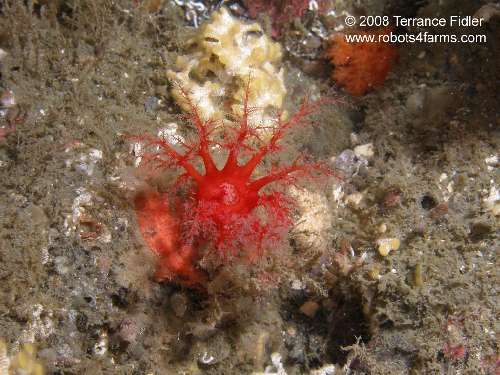 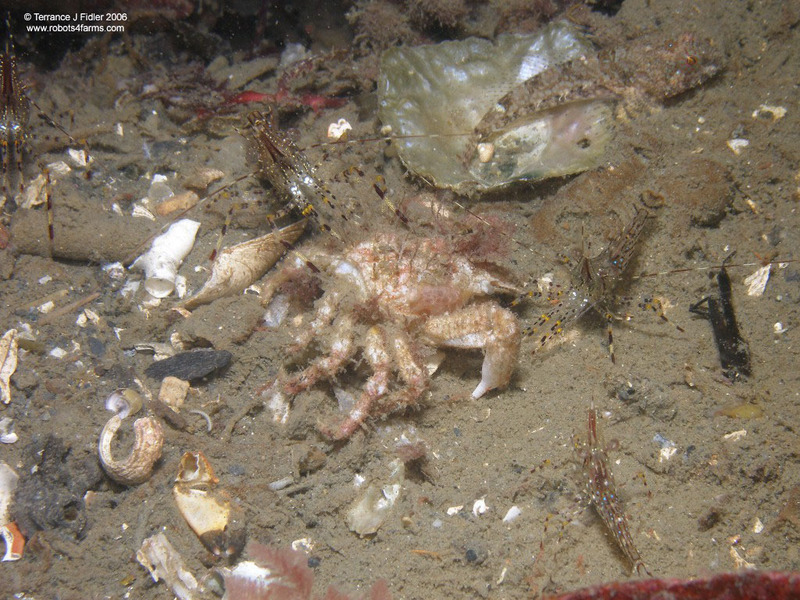 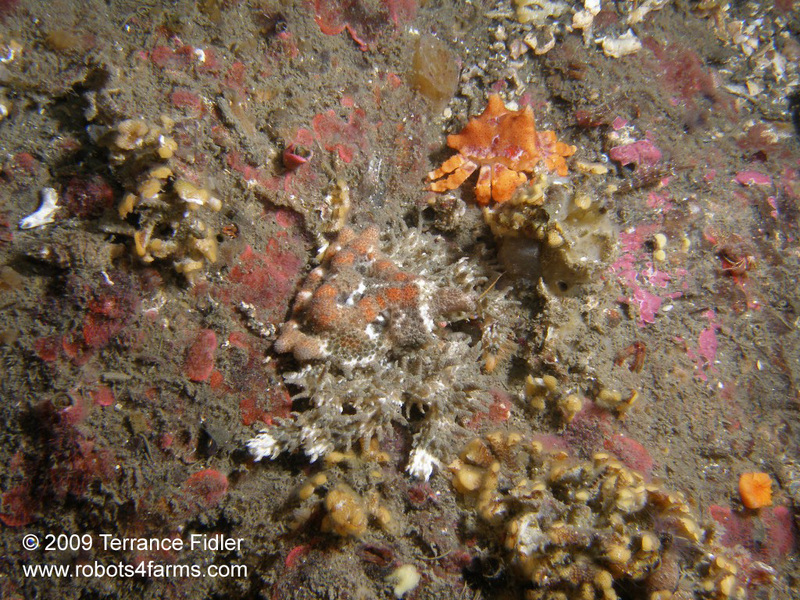 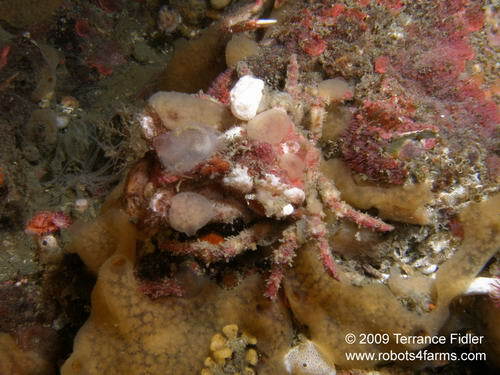 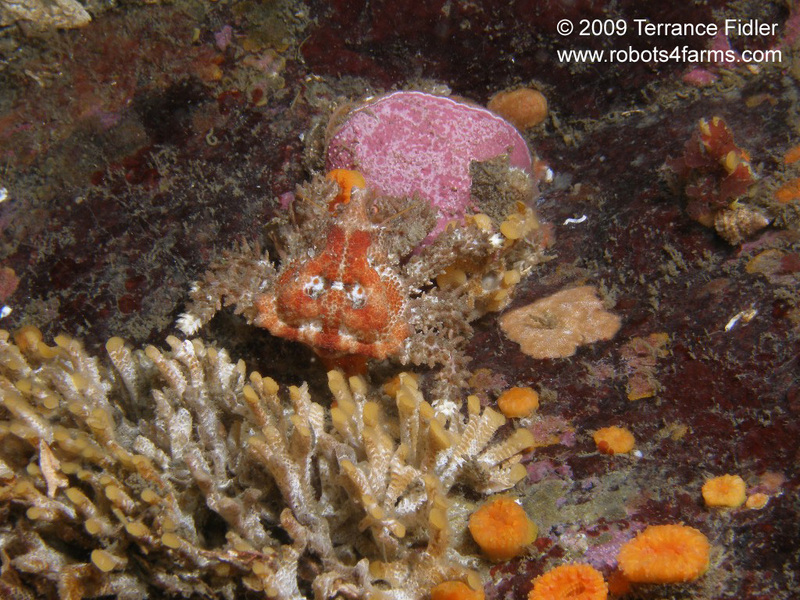 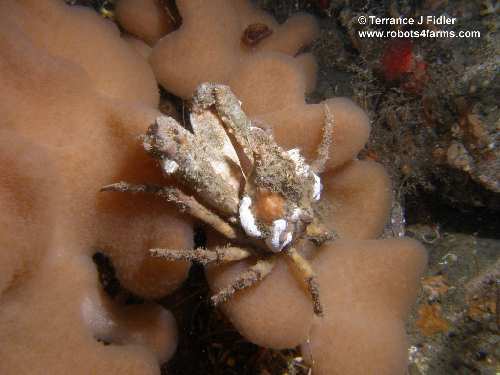 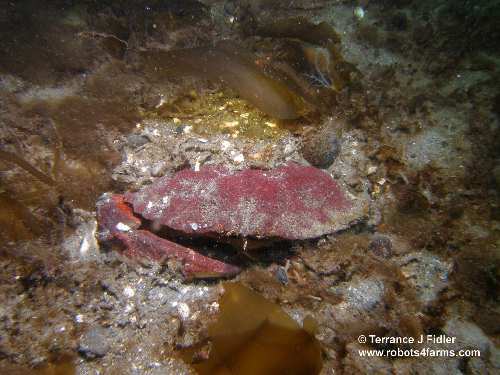 Decorator Crab [most of the image]. 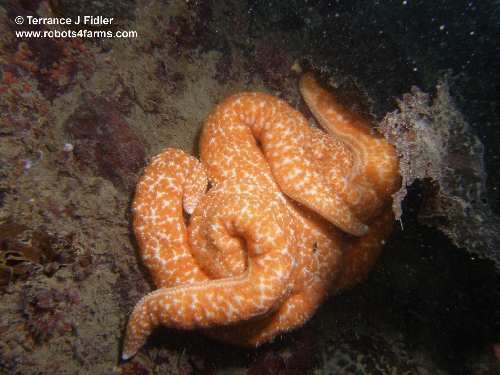 Very common at this dive site. 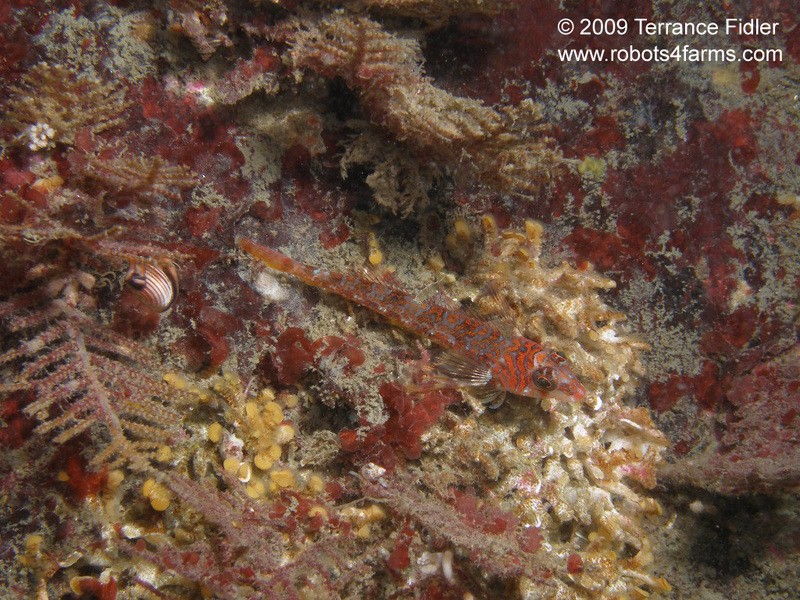 A few Coonstriped Shrimp [Spirontocaris holmesi] checking out a dead crab. Less than 3 inches [7.5 cm] long. 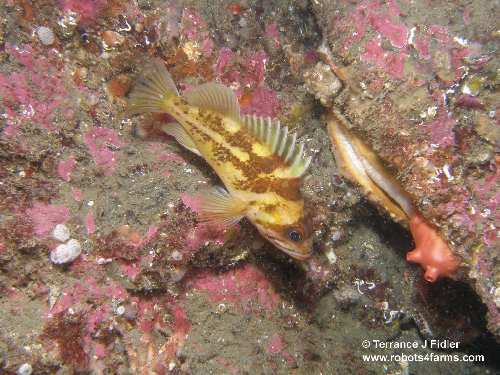 Also note the sculpin in the background. 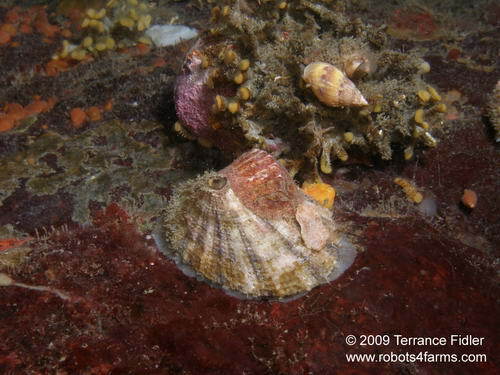 across the shell. This image is also found on one of the 2009 Calendars. a picture, but the fishing line beside it made me stop. slightly buried in the sand. As if they are hiding or were digging for food. 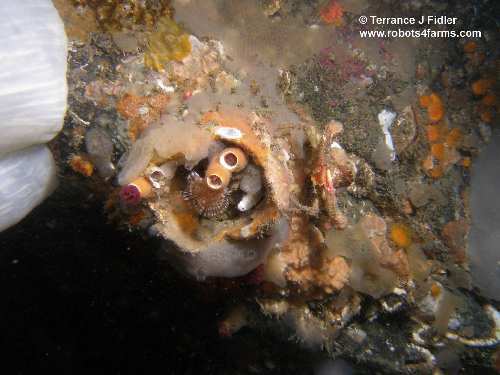 dead Giant Acorn Barnacle. 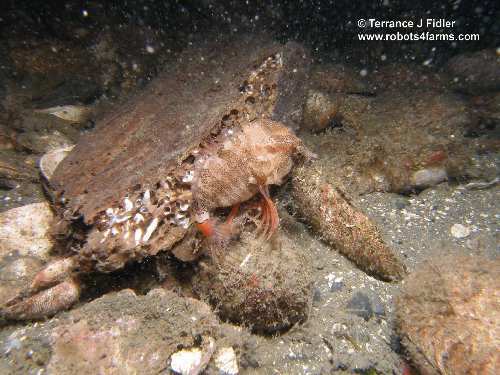 About 4 inches [10 cm] at the opening of this "shell". fish images for related image] About two inches [5 cm] across its carapace. Giant Acorn Barnacle ~ 3 inches [7.5 cm] wide for just its opening feeding "arms." 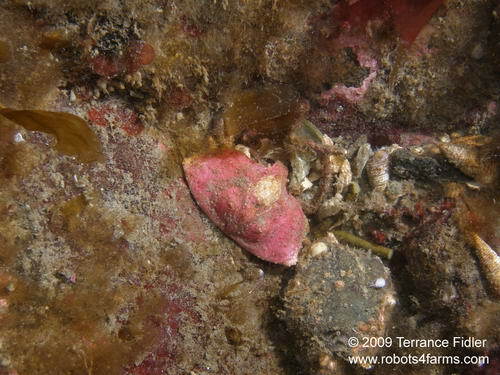 Heart Crab [Phyllolithodes papillosus] ~ 2 inches [5 cm] wide. This is a young one. 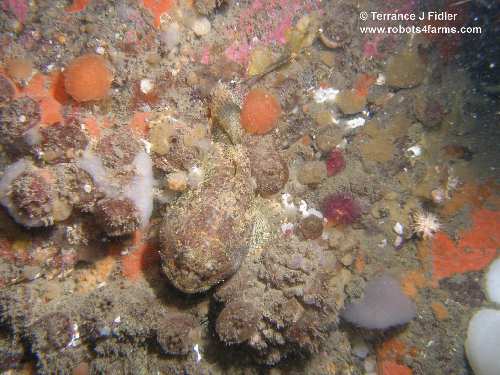 and a Heart Crab [Phyllolithodes papillosus] ~ 4 inches [10 cm] widel. 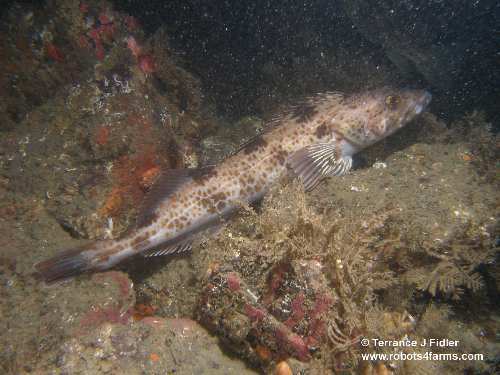 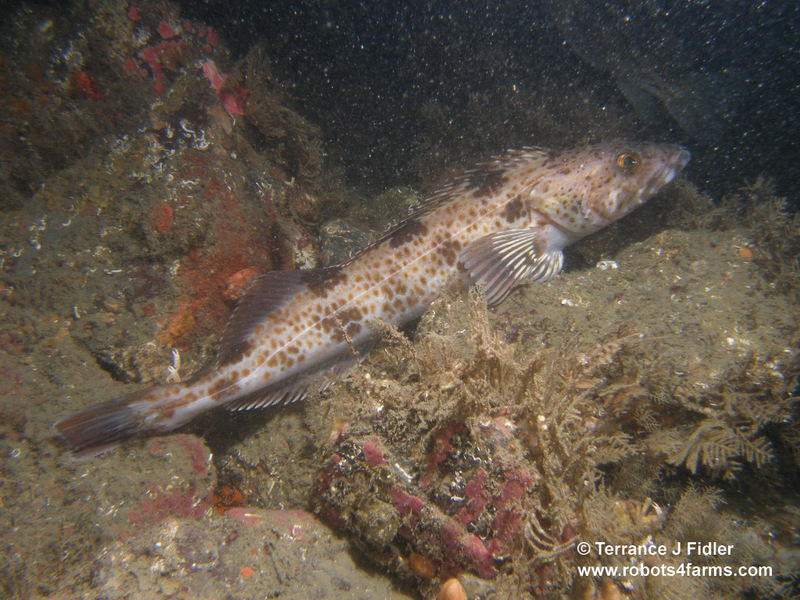 Ling Cod (juvenile) ~ 3 feet [1 m] long. 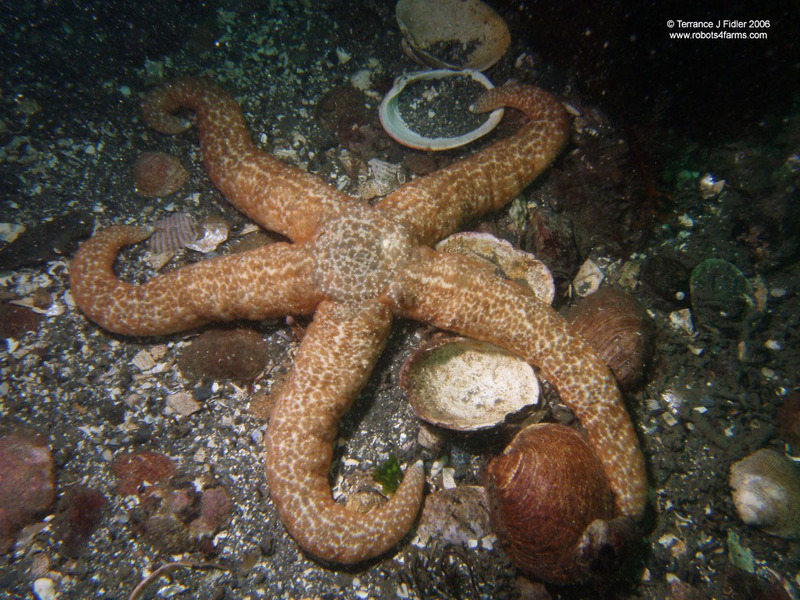 Quite common at this dive site. 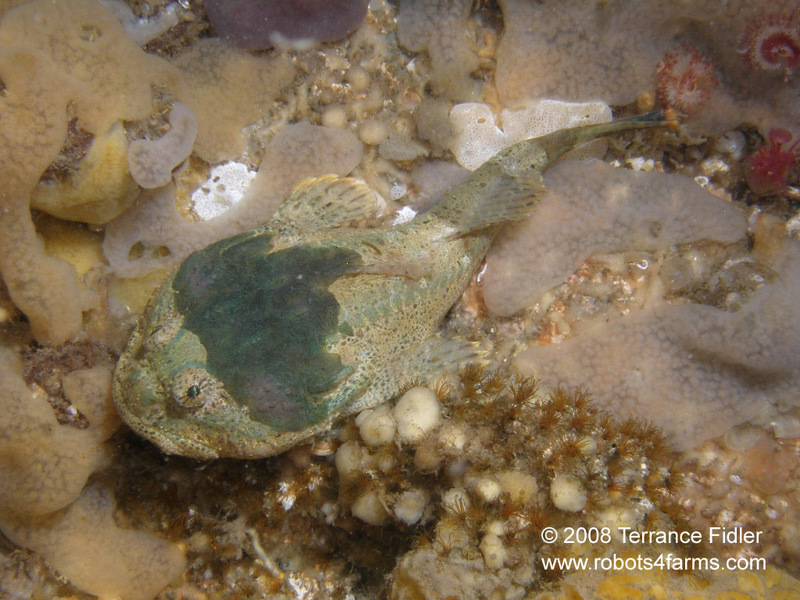 Buffalo Sculpin ~ 14 inches [35 cm] long. 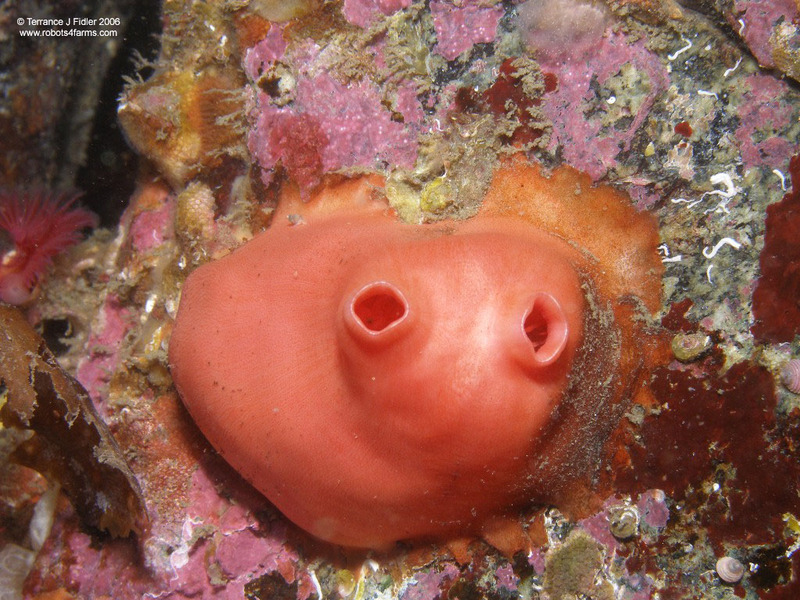 Common at this scuba dive site. 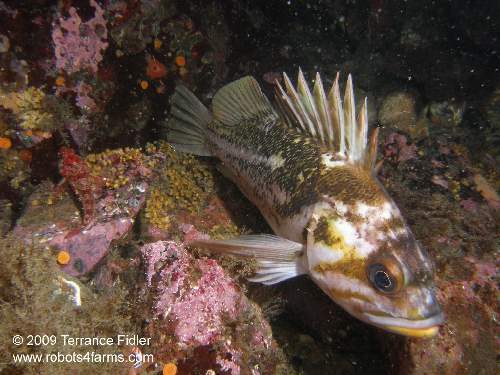 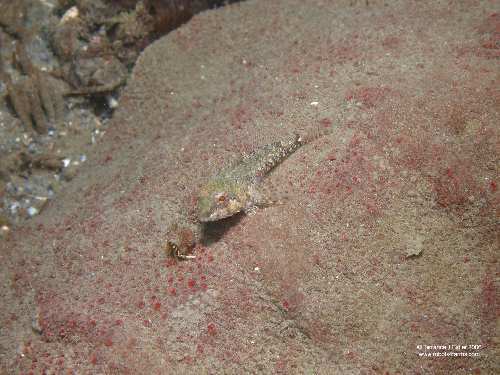 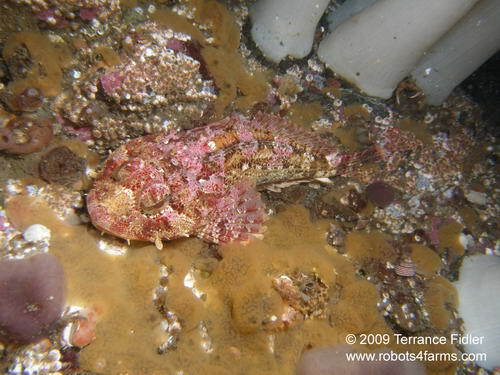 A baby Longfin Sculpin. 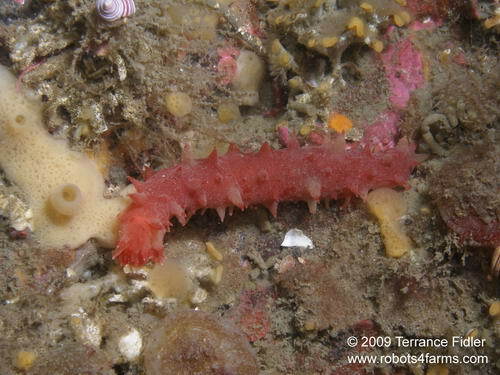 ~ 2 inches [5 cm] long. 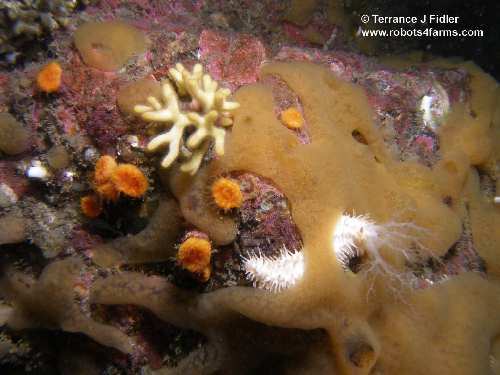 And a few Orange Cup Corals. 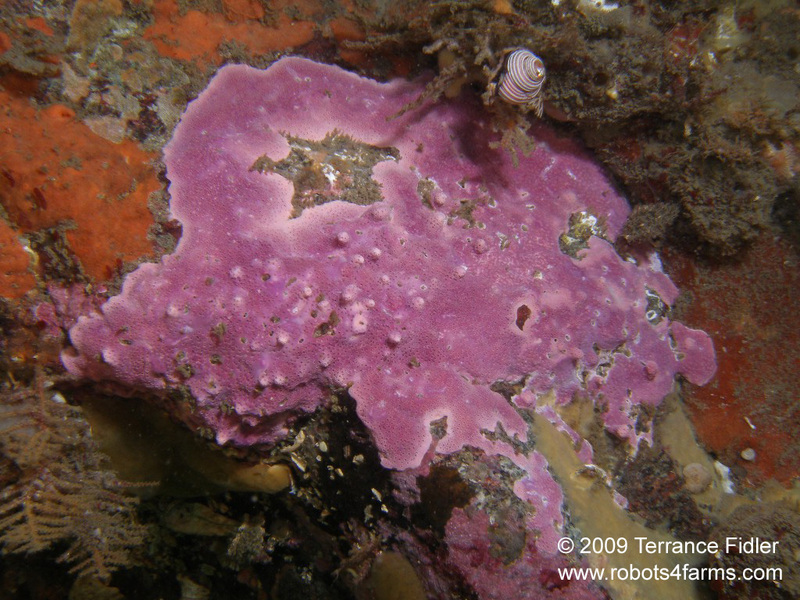 diving site. Note the shrimp in the back ground. 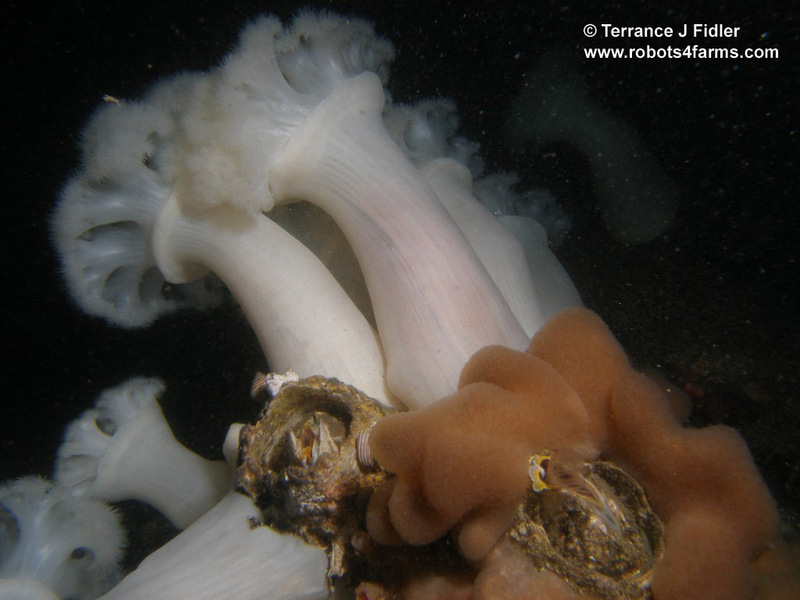 near the large group of giant Plumose Anemones. 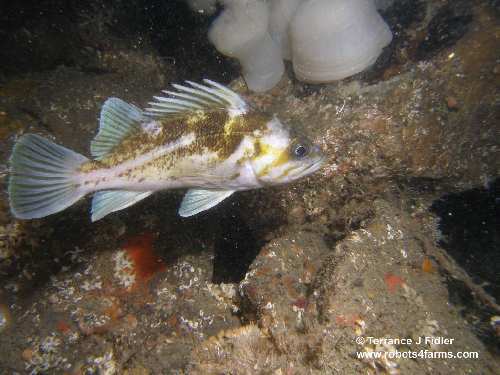 up shots of this fish. 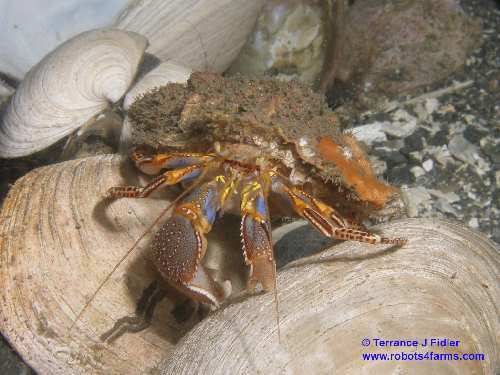 stay still long enough and water quality too poor for a strobe. Rock Scallop ~ about 12 inches [30 cm] across. Very common here. water time is usually against me. 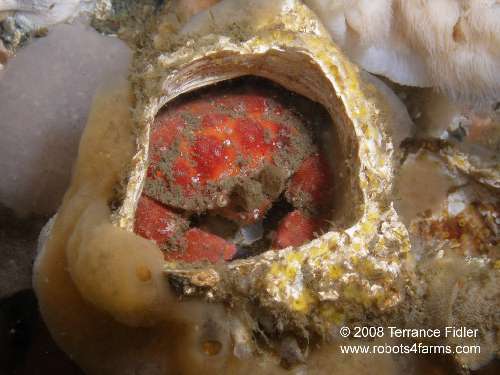 (April 5, 2009) Keyhole Limpet ~ 2 inches [5 cm] in diameter. 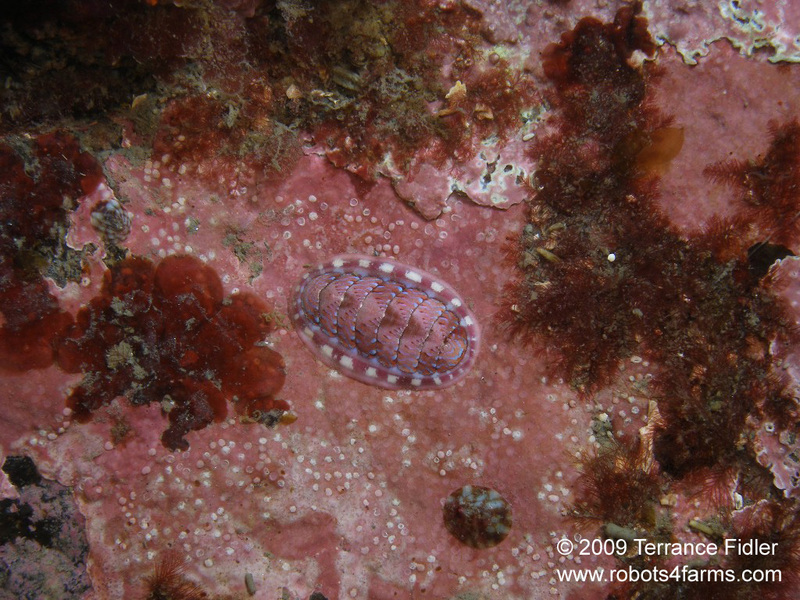 Note the small Chiton on top of it. 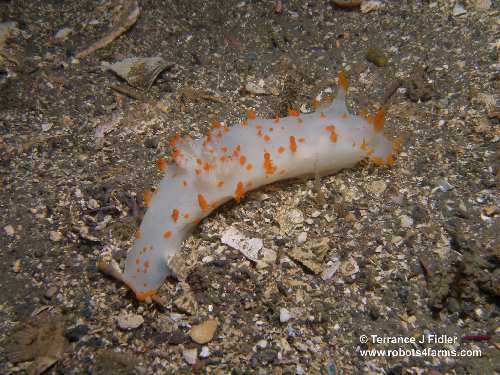 Clown Dorid [Triopha catalinae] ~ about 4 inches [10 cm] long. 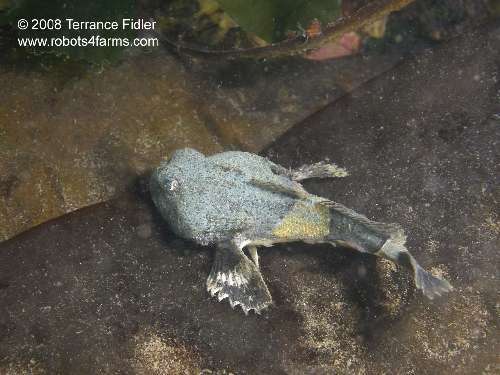 Very common here. 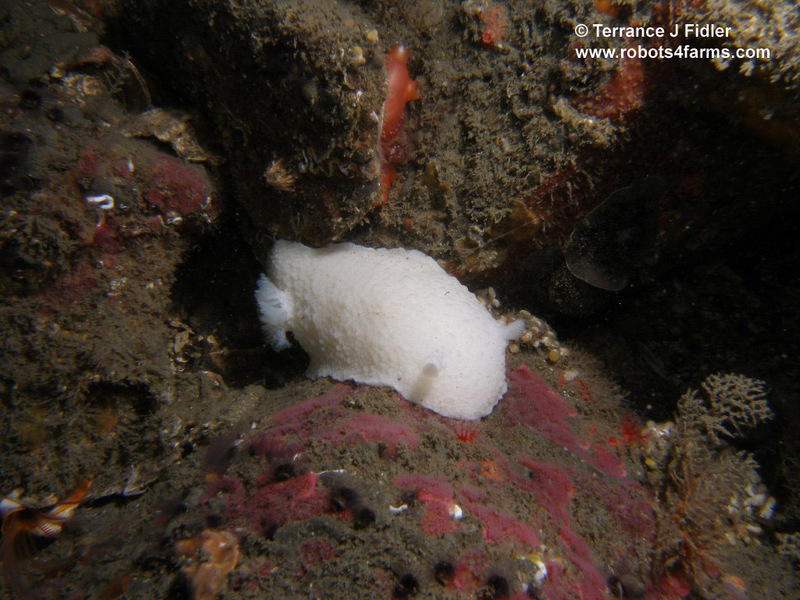 Giant White Dorid ~ about 5 inches [12.5 cm] long. 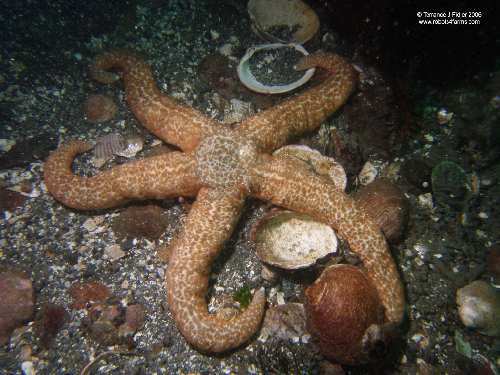 Not that common here. 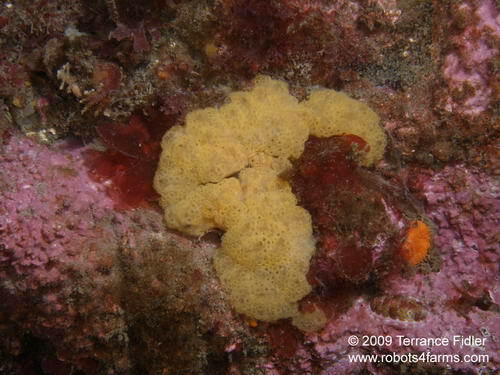 A Lemon Dorid [Doris montereyensis] on sponge. 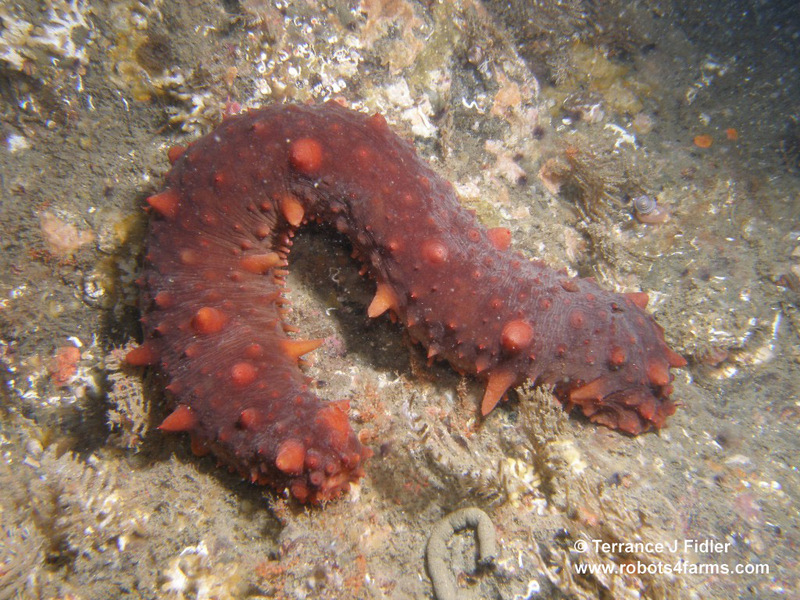 ~ about 6 inches [15 cm] long. 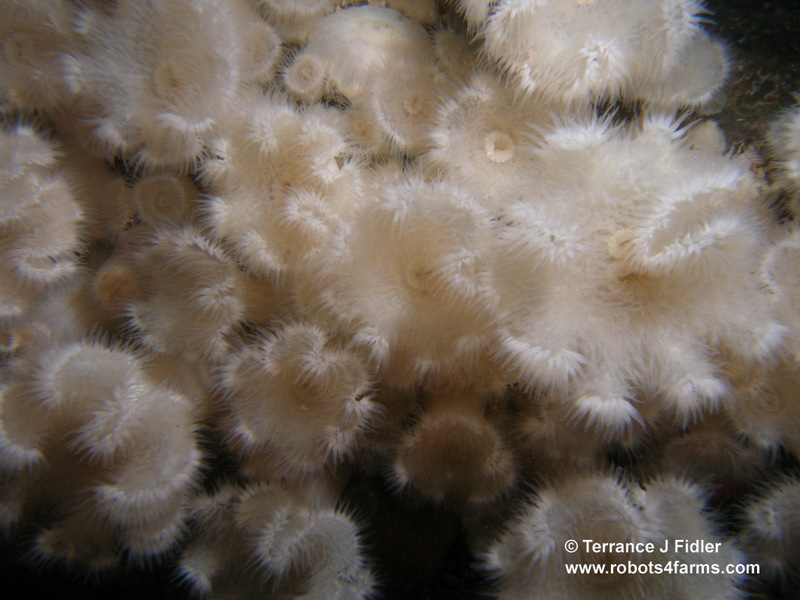 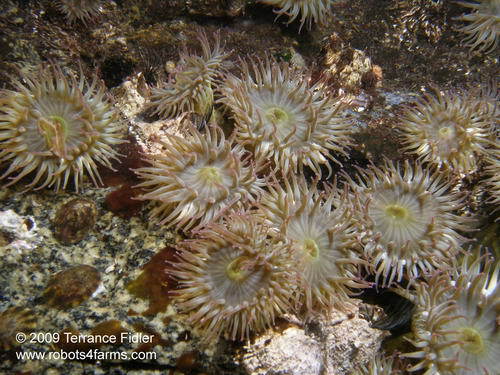 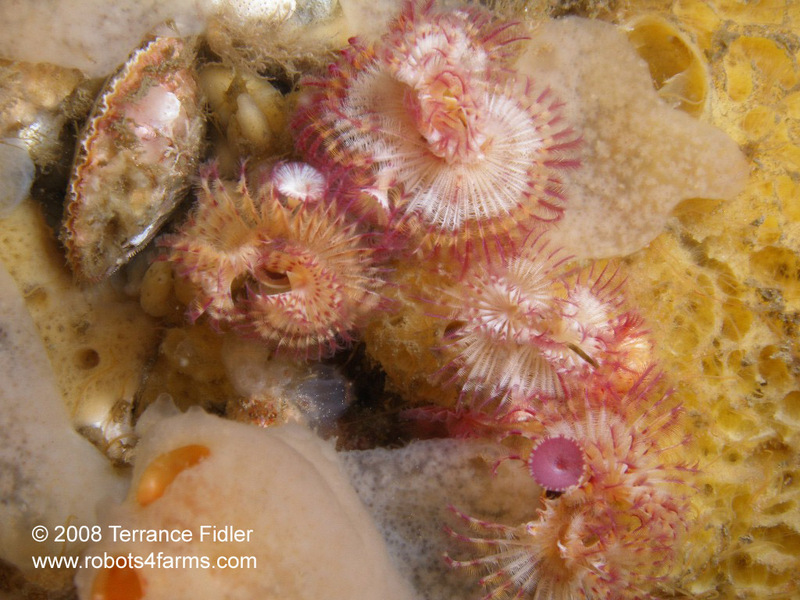 Plumose Anemones. These are at most only about 12 inches [30 cm] in width. 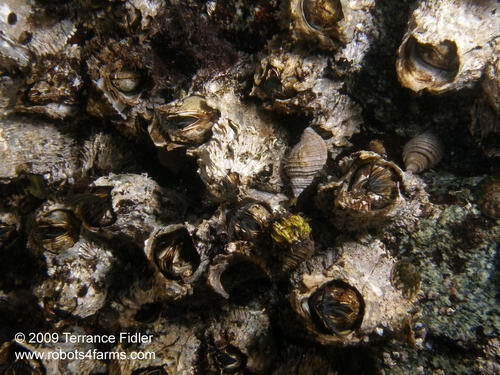 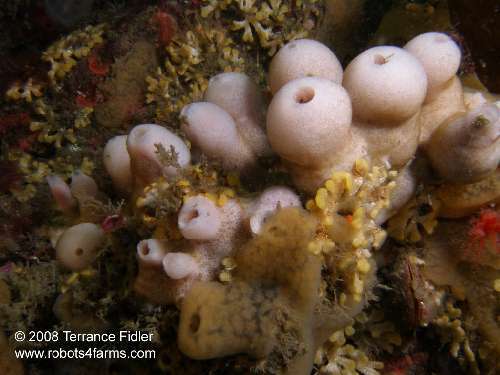 tunicates at their base - the brown stuff, and a couple of Giant Acorn Barnacles. 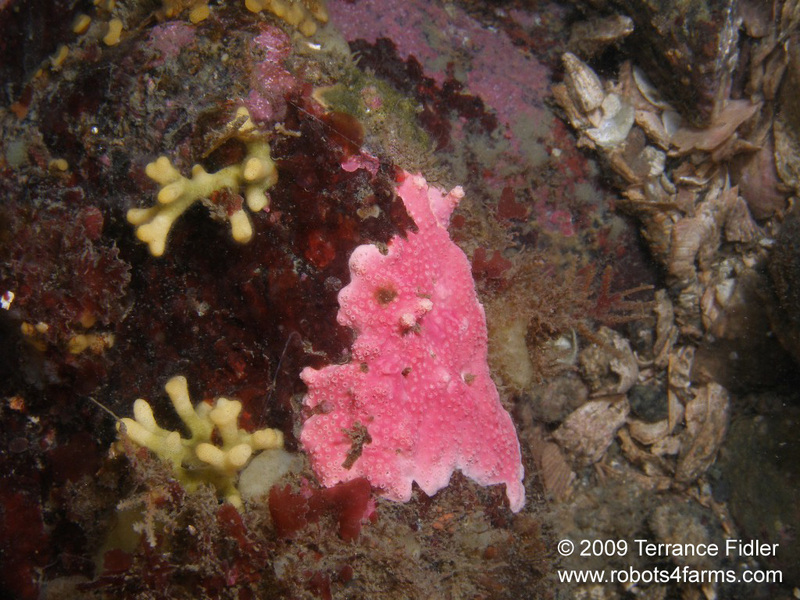 Pink Encrusting Hydrocoral ~ 6 inches [15 cm] tall. 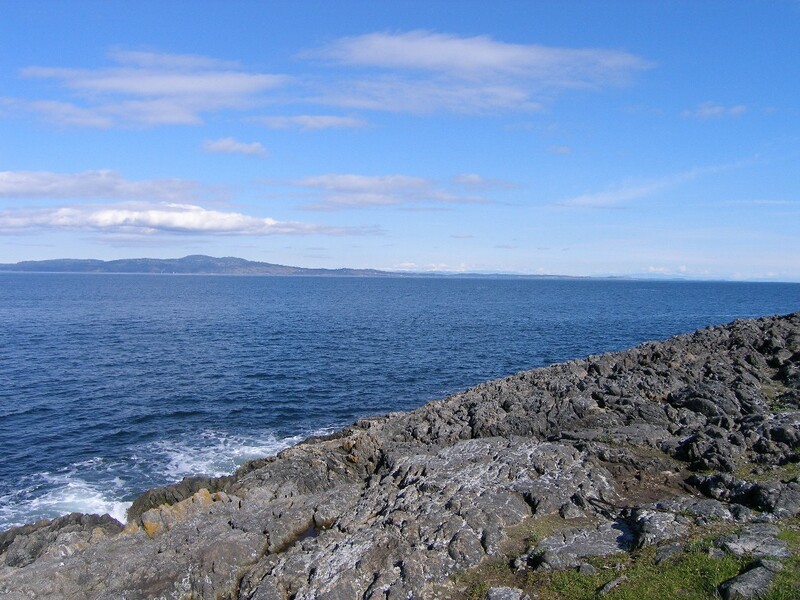 The normal flat variety. 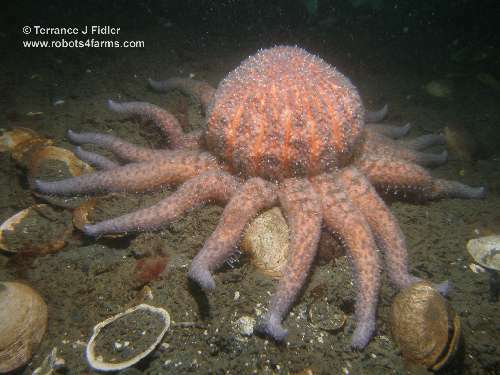 on this one. Hopefully it will become more "tree-like" making it even more beautiful. 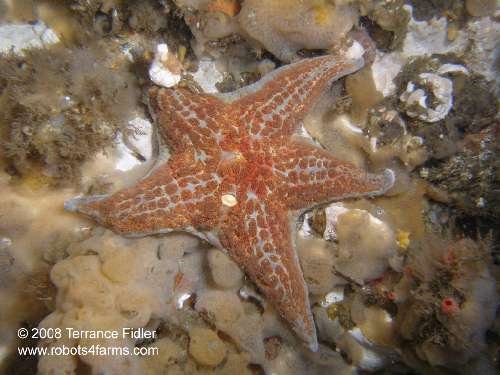 was swimming along the shore to Spring Bay and I saw thousands of them. 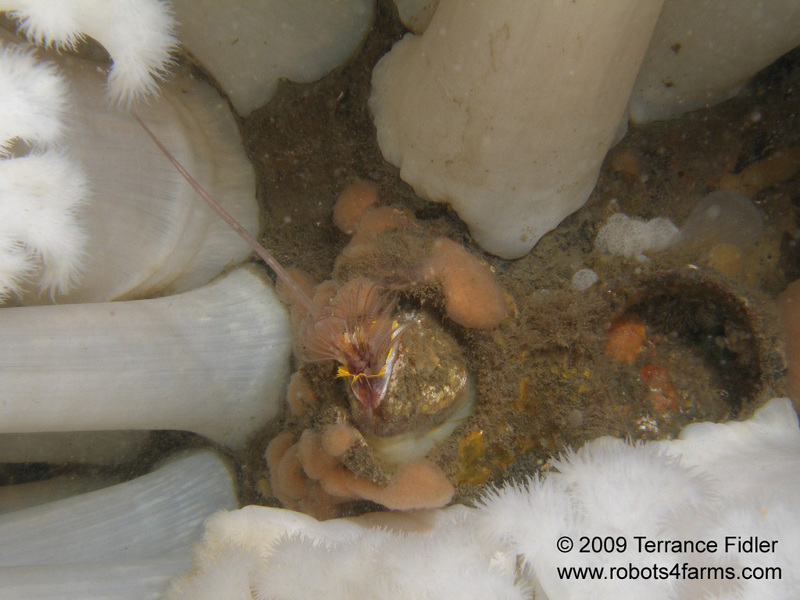 A young White Sea Cucumber hiding in behind some lobed tunicates. 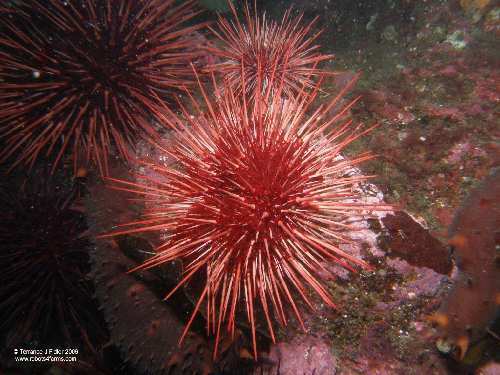 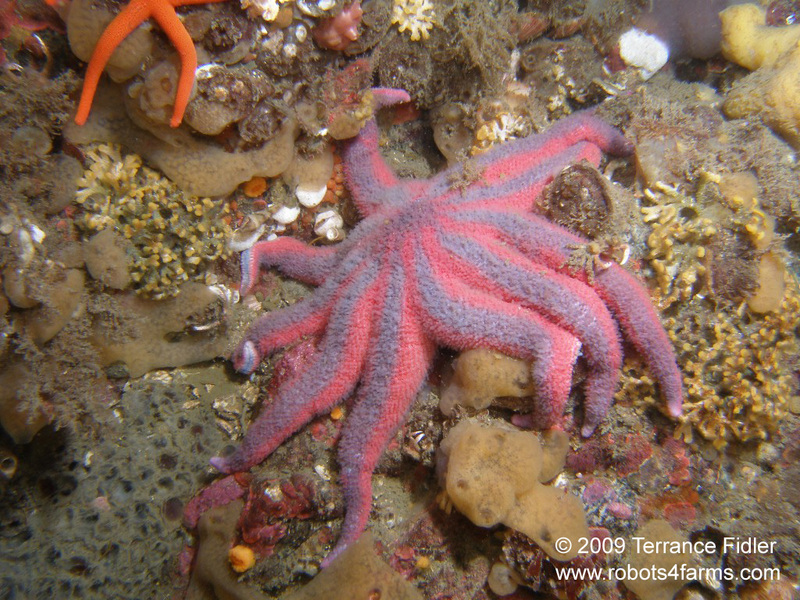 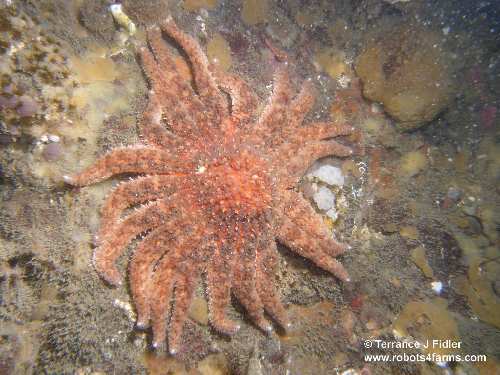 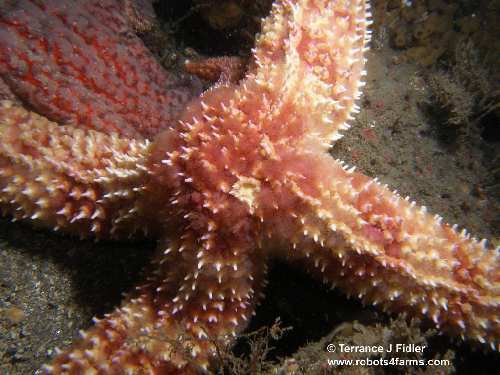 Sunflower Star eating something ~ 3 feet [1 metre] wide. 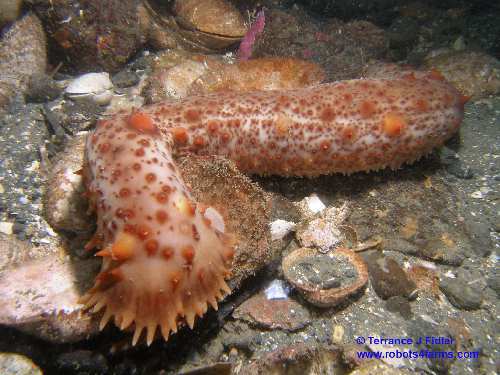 Very common here. and a turtle running for their top speed. 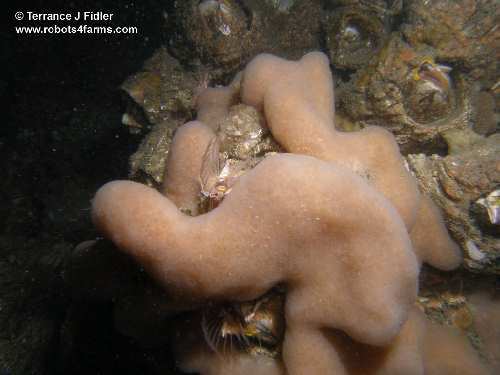 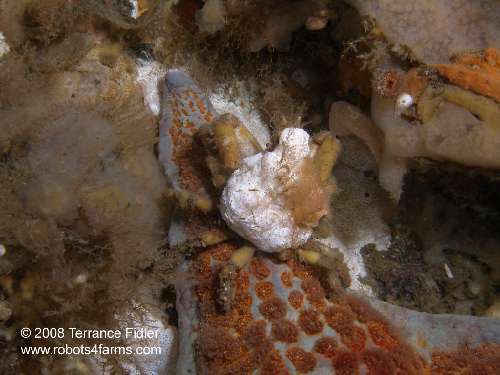 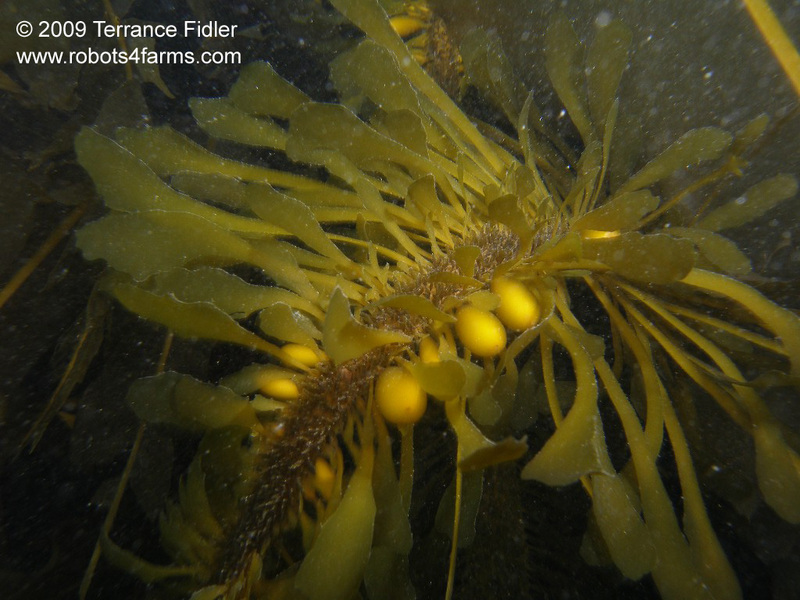 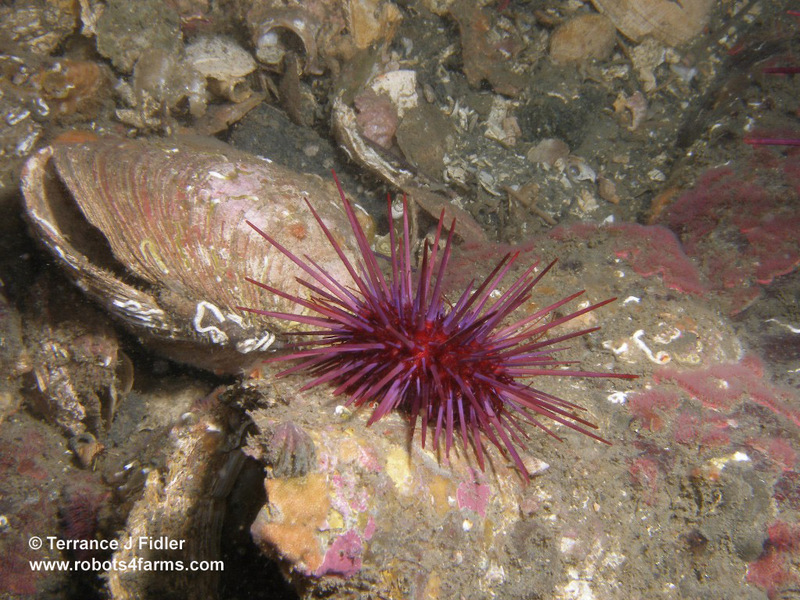 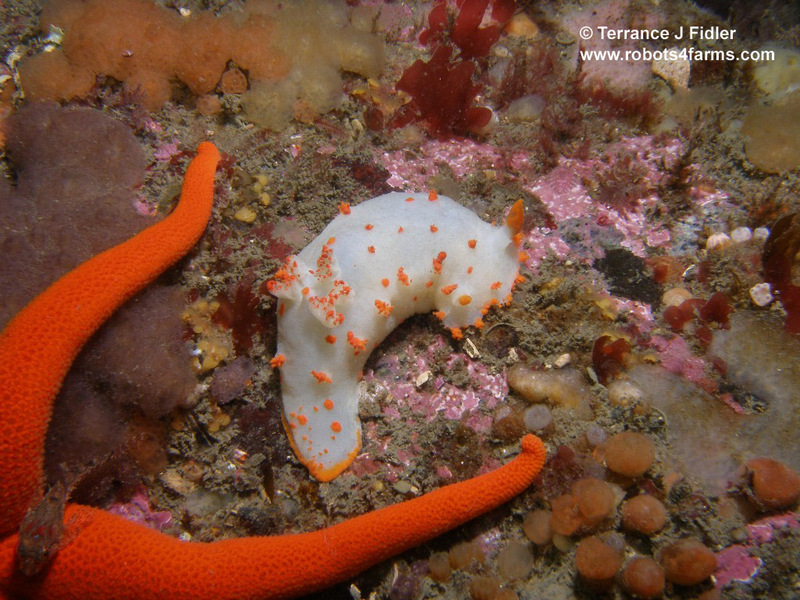 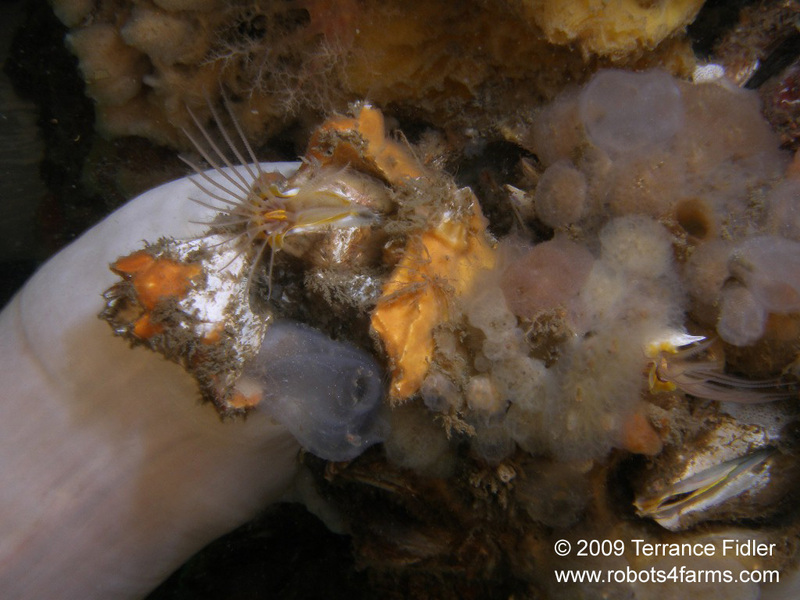 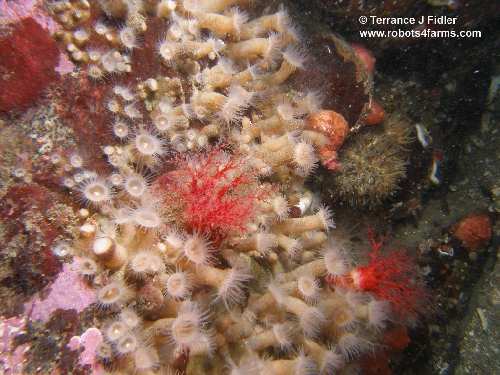 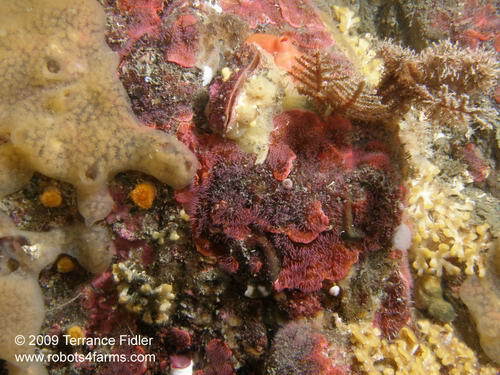 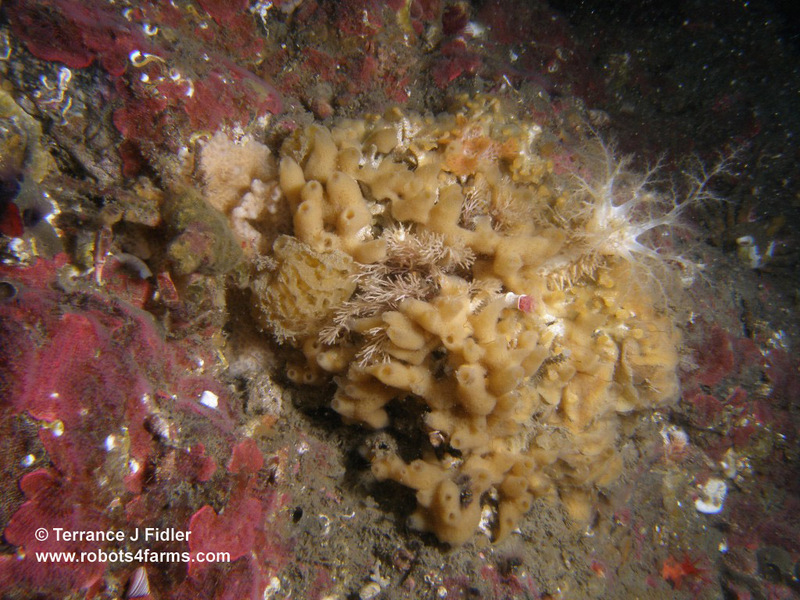 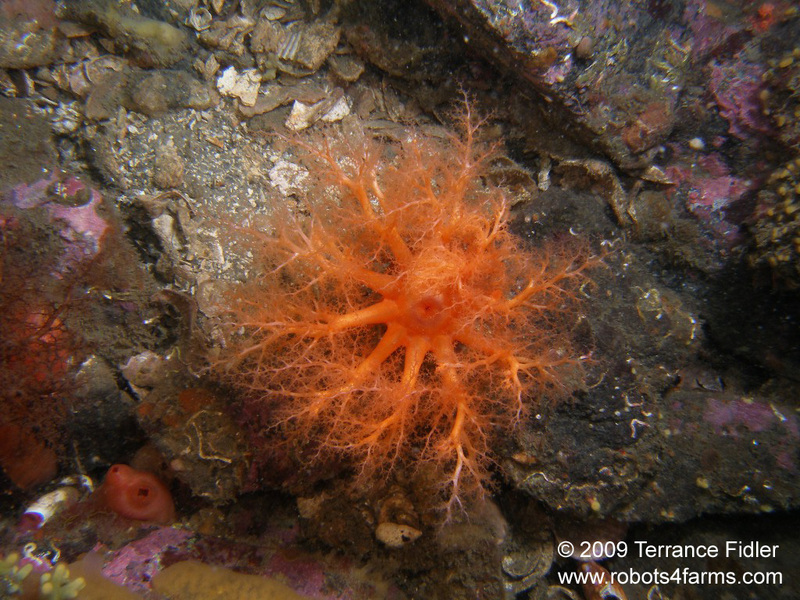 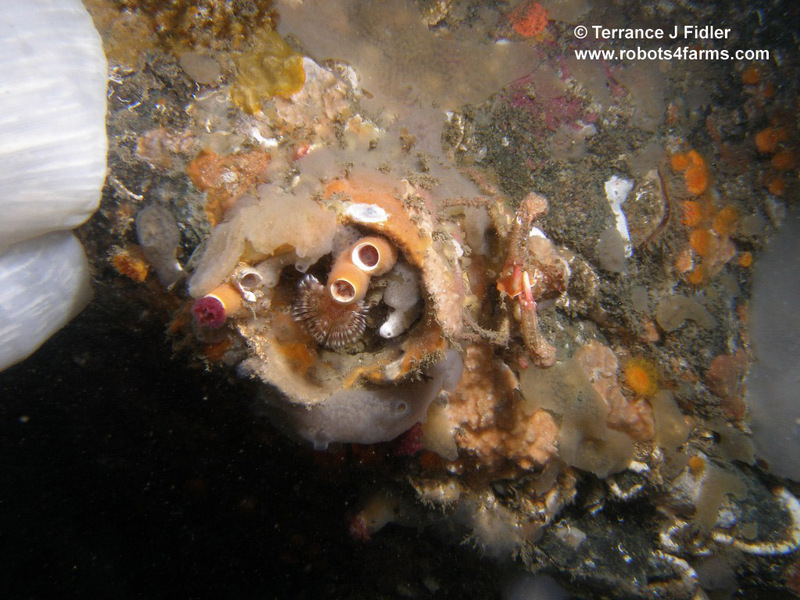 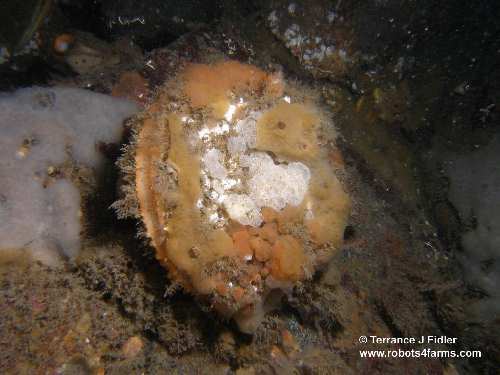 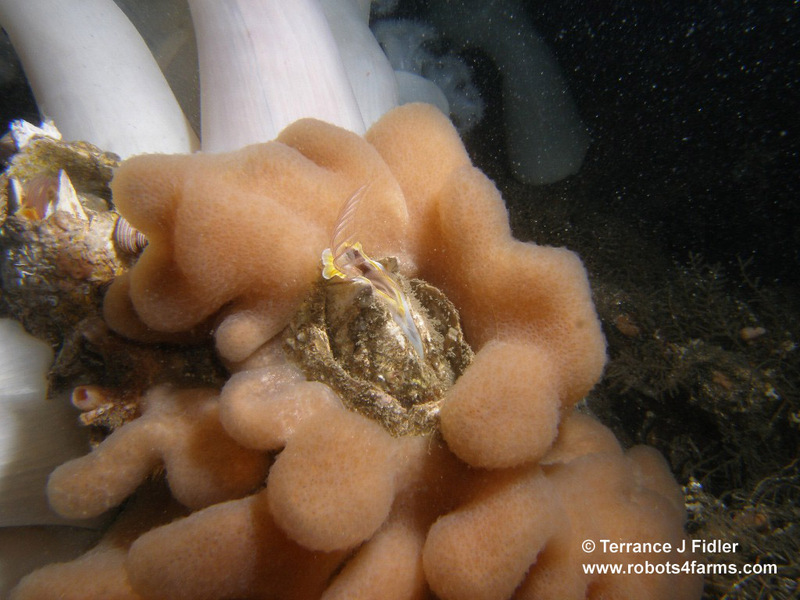 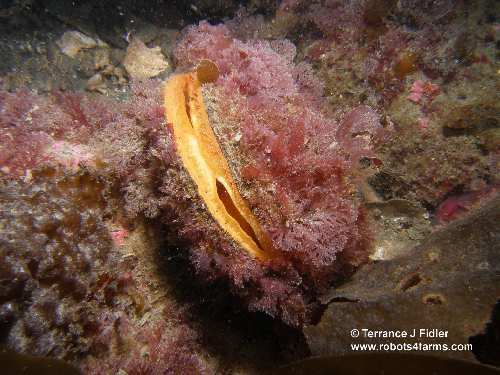 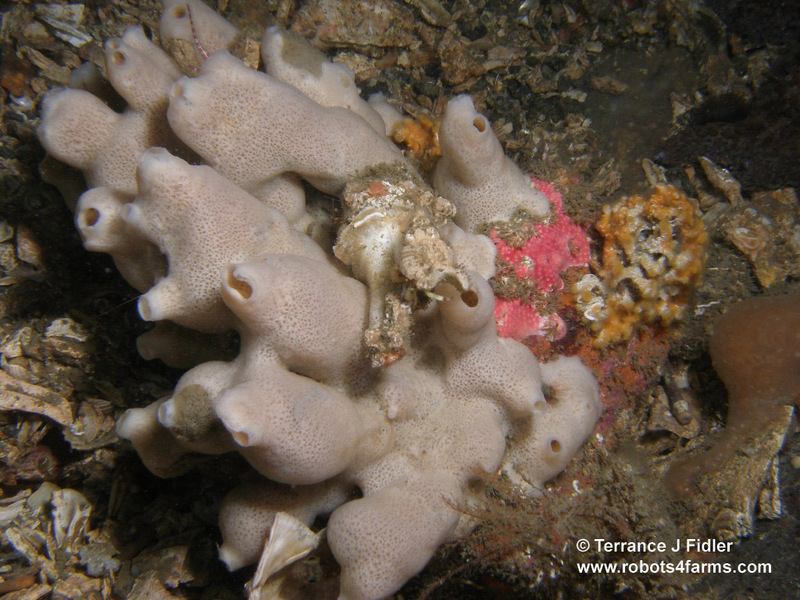 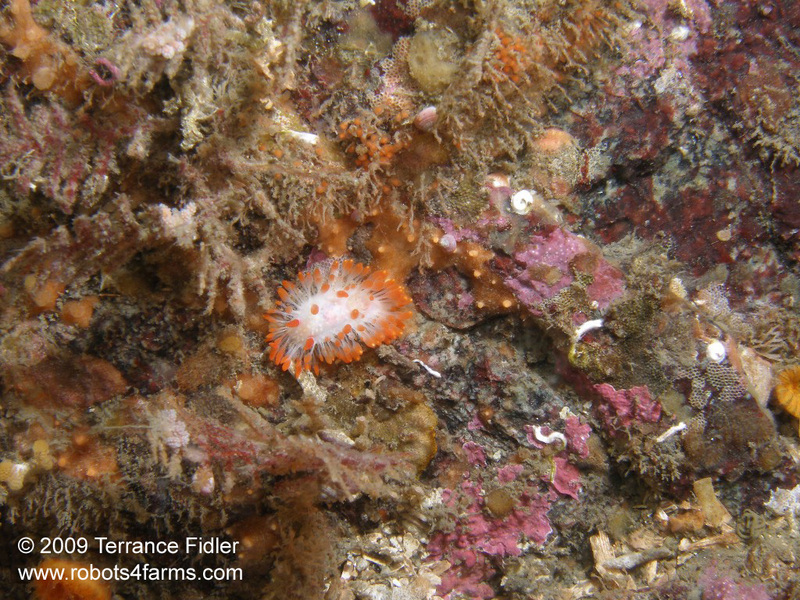 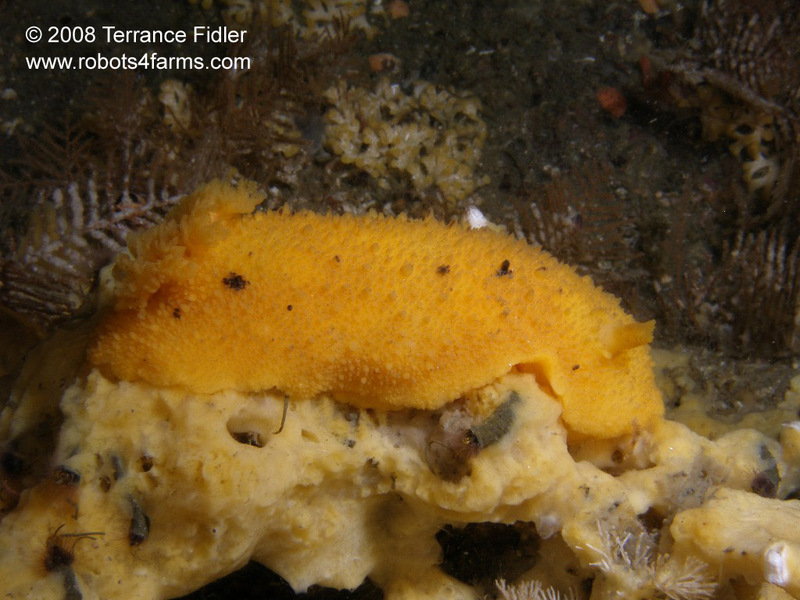 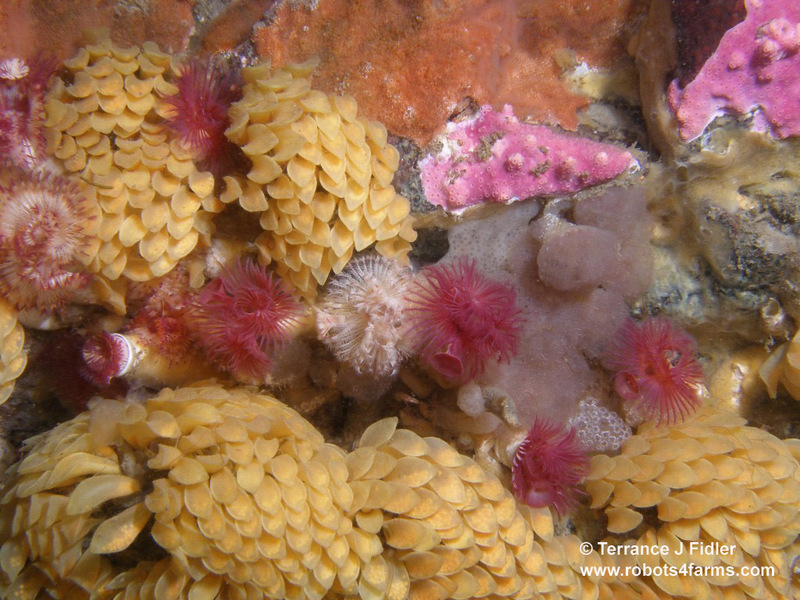 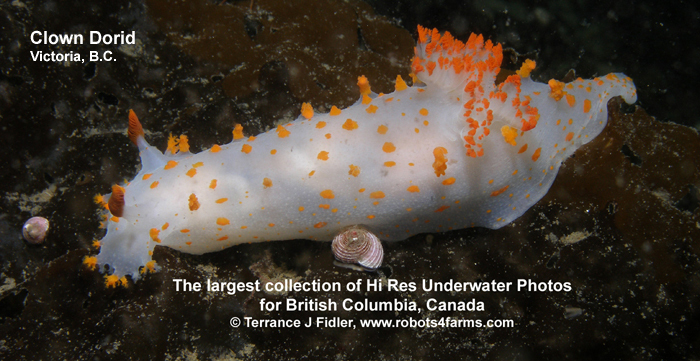 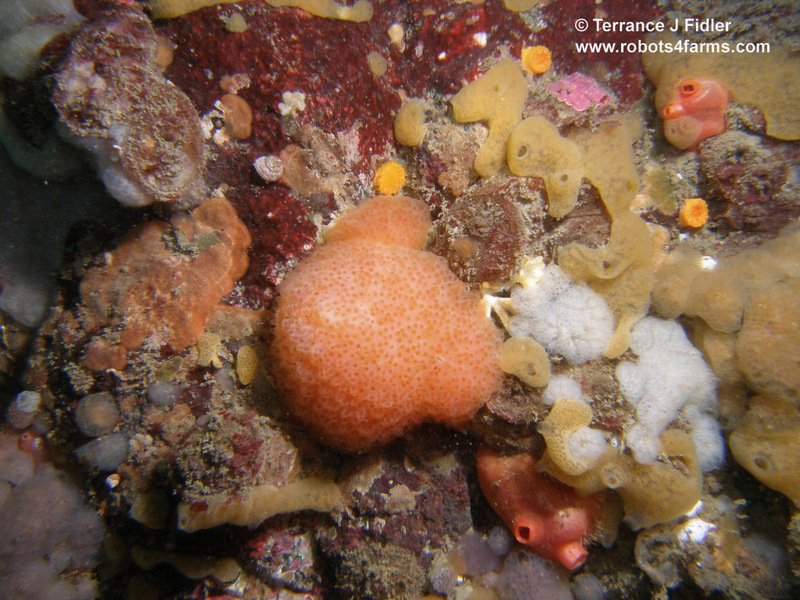 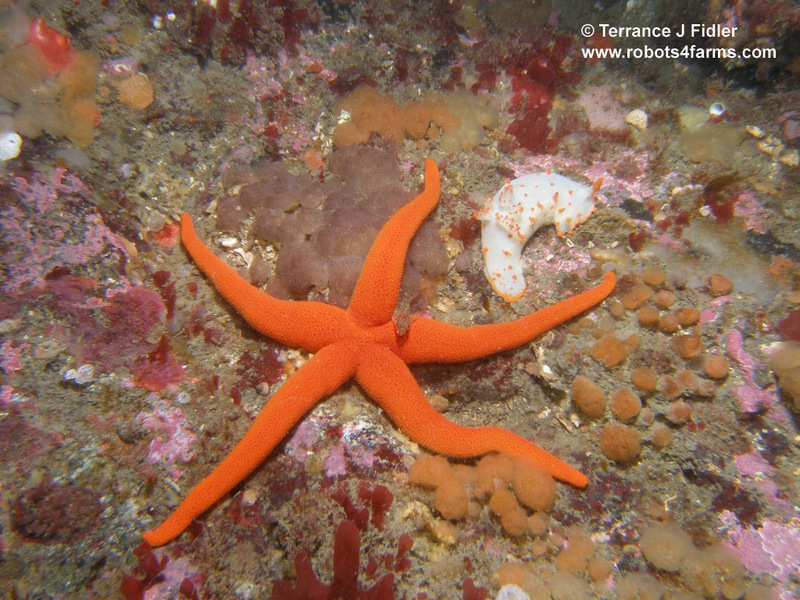 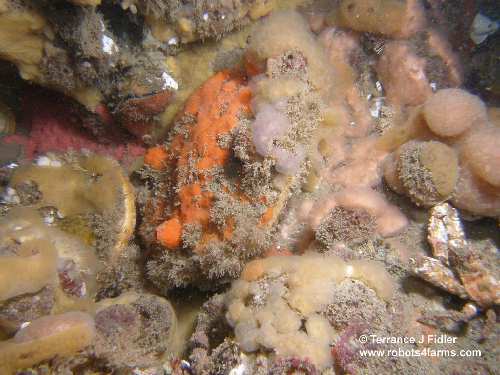 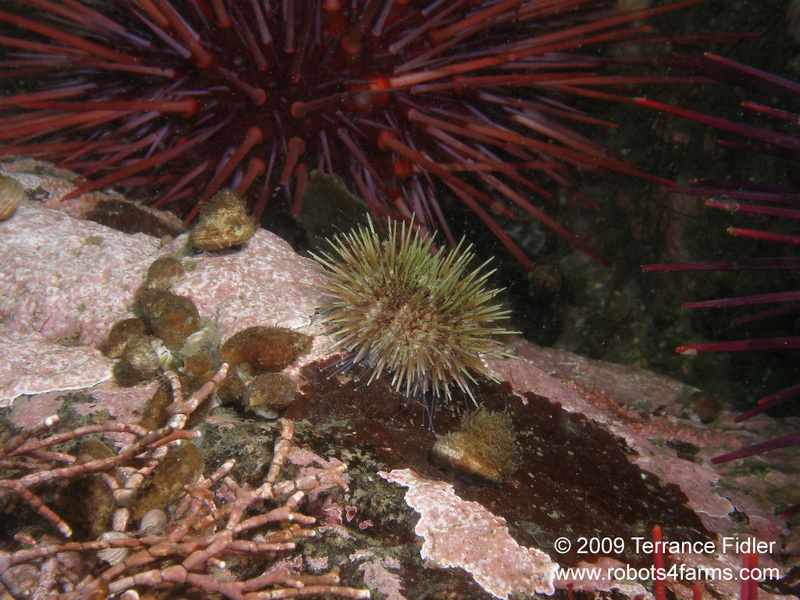 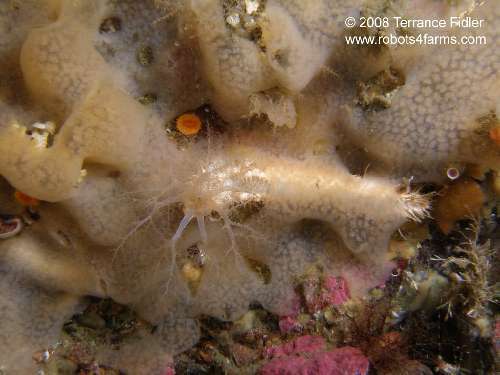 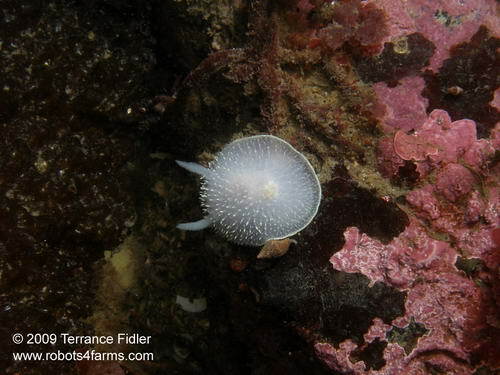 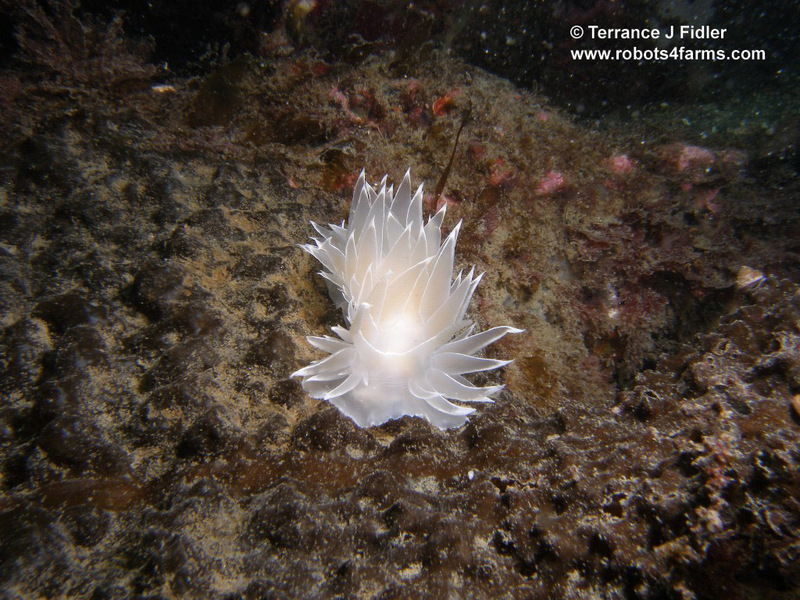 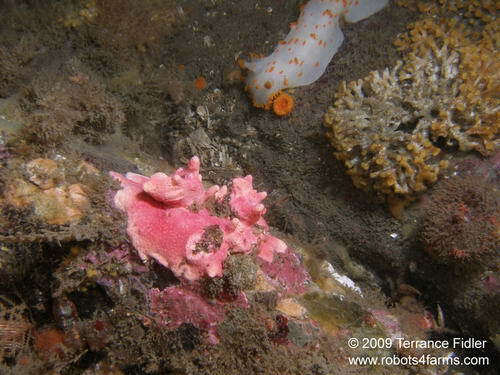 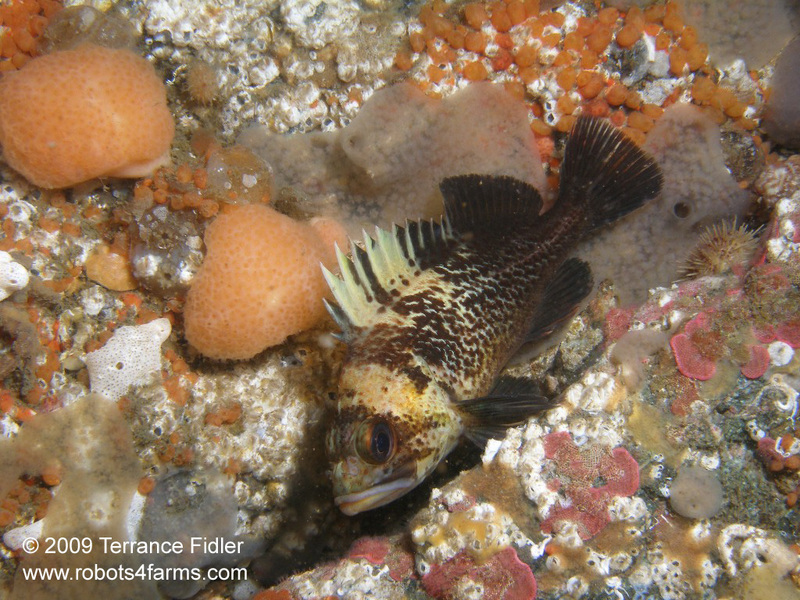 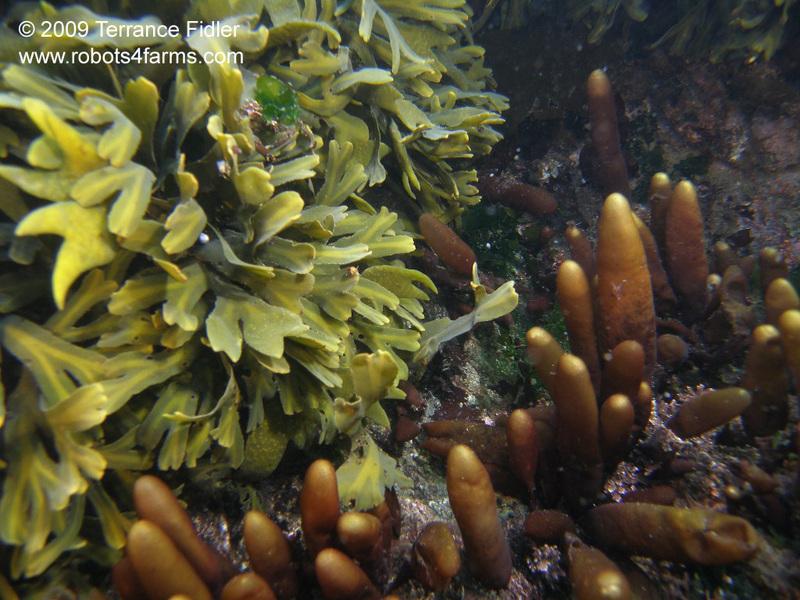 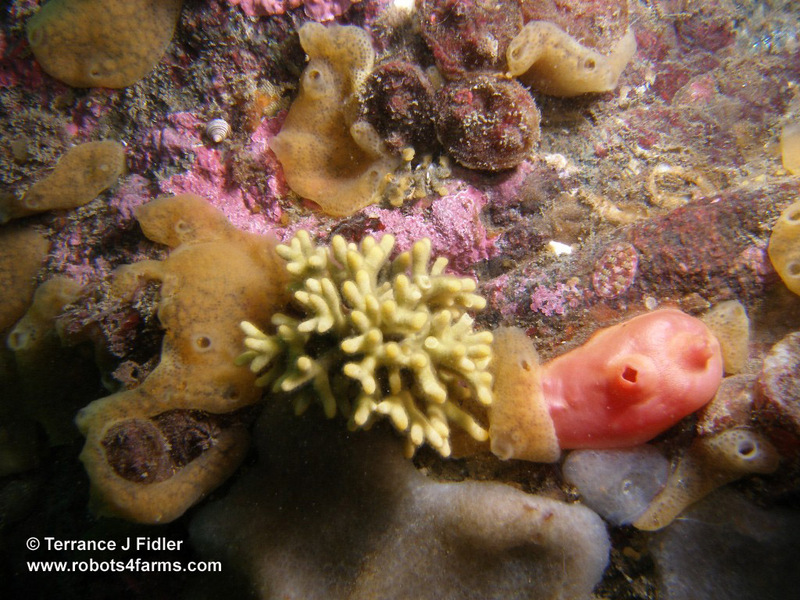 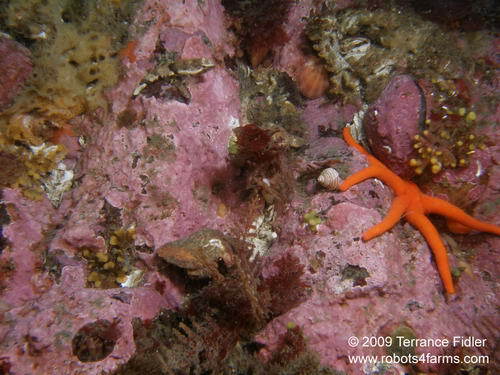 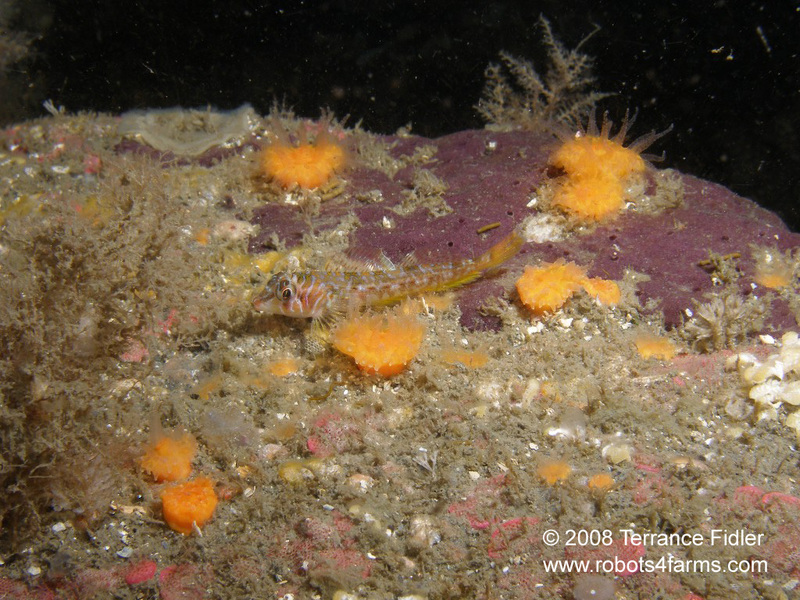 (Sept 14, 2008) A young White Sea Cumber hiding behind what appears to be colonial tunicates. 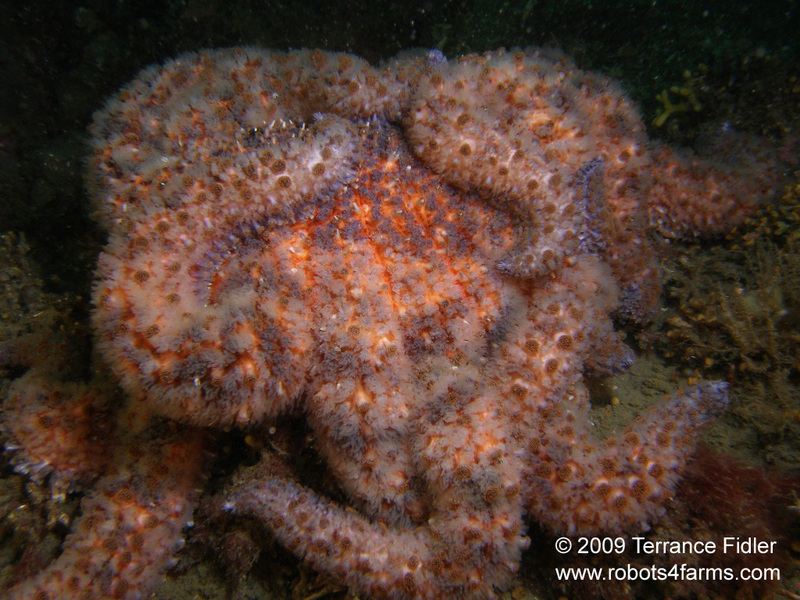 Same situation as the picture above and to the left. 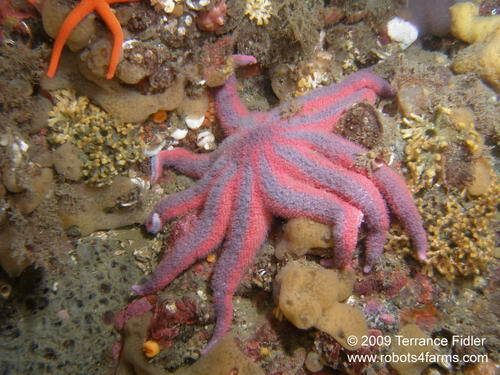 Quite common here. A close up of a Creeping Petal Sea Cucumber. 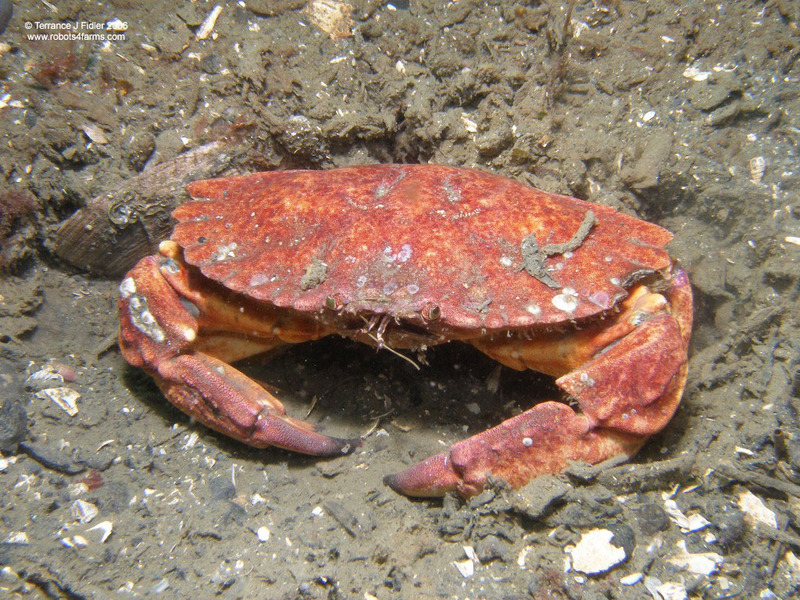 ~ about 4 inches [10 cm] across. Note that it has one of its arms in its mouth. They "lick" of the food of their arms. 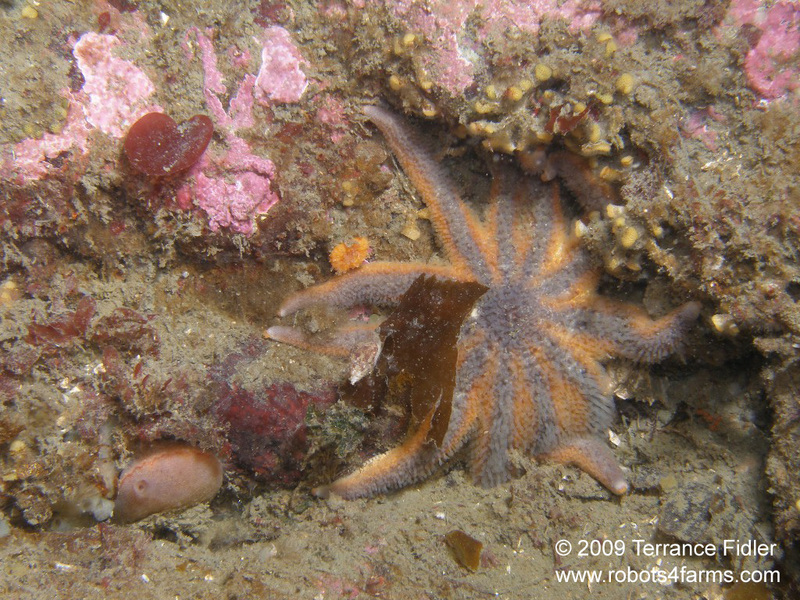 sized, but for some reason a few this day seemed to be curled up this way. 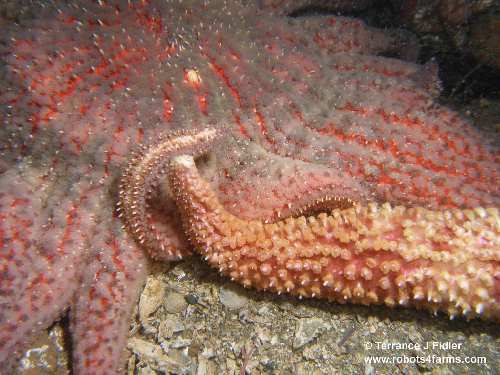 Itchy? in its mouth to clean off the particles it has caught. 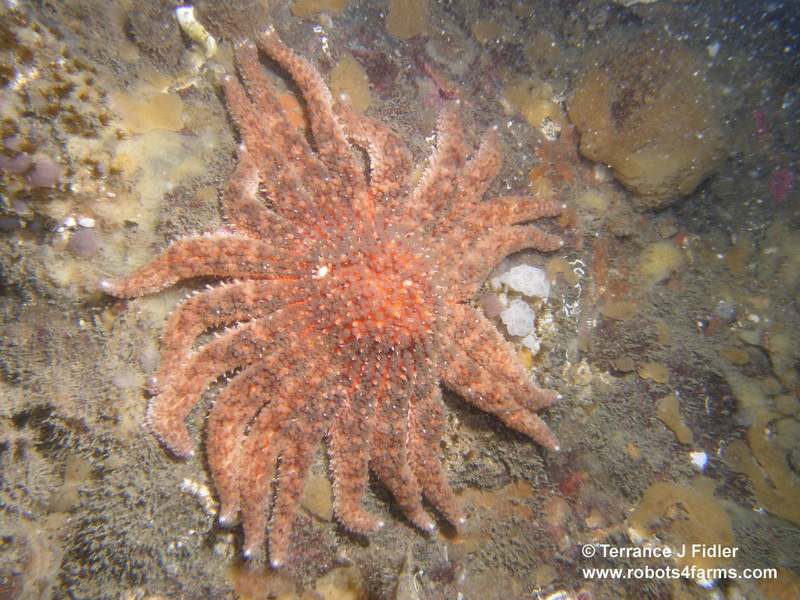 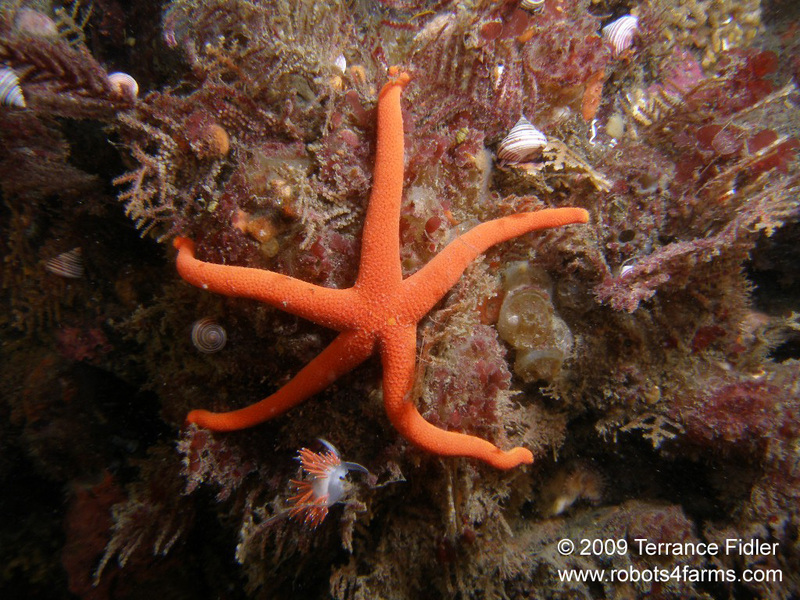 Striped Sun Star ~ 2 feet [60 cm] across. Not the usual orange coloured ones. 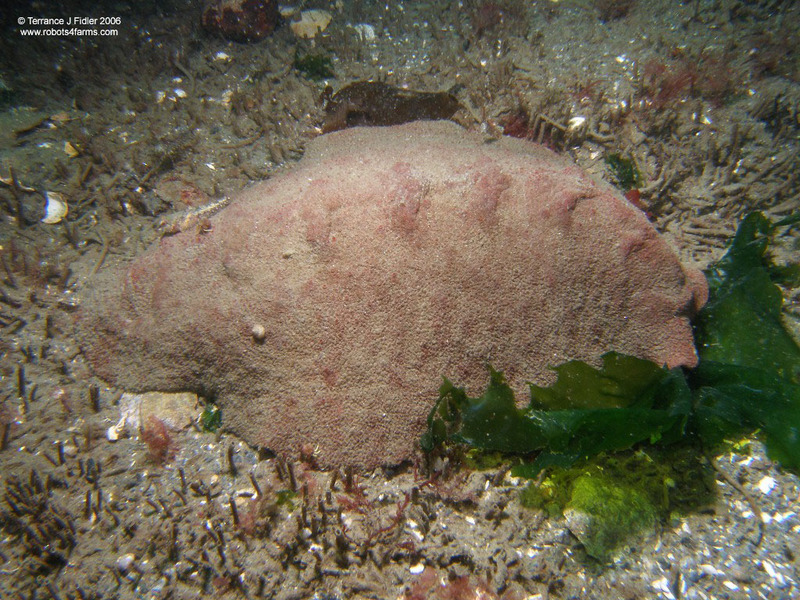 Rosy Bryozoan ~ 8 inches [20 cm] across. Common at the wall at this dive site. They are the reddish coloured mass in the middle of this digital image. 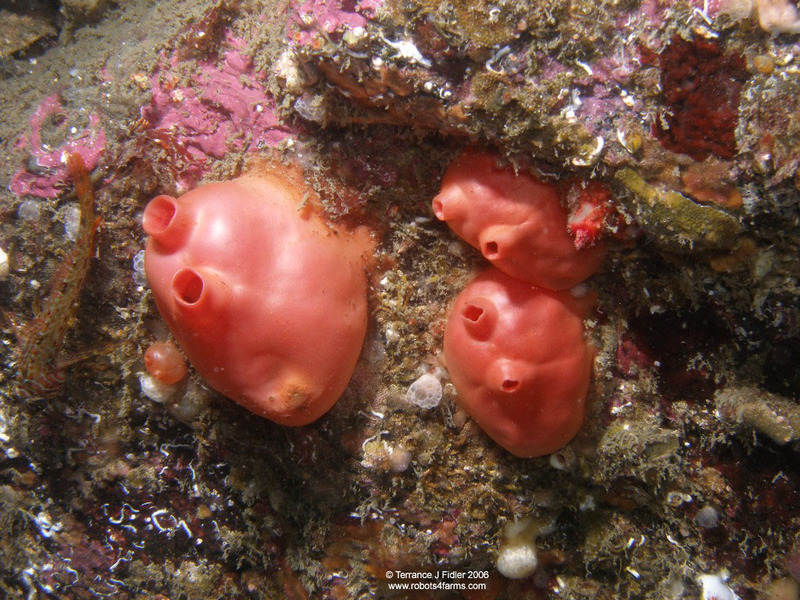 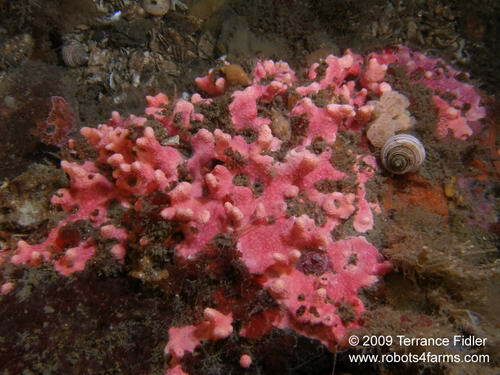 Note this is also my first picture of Pink Encrusting Hydrocorals. Sea Sacs ~ 5 inches [12.5 cm] tall. 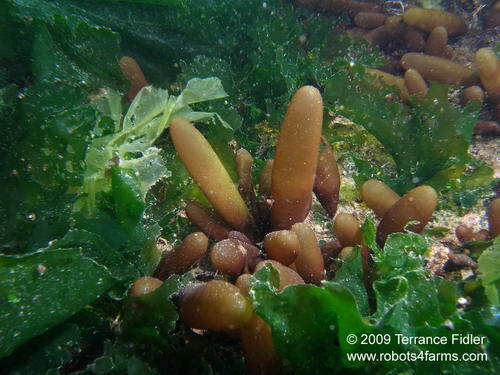 Common in the shallows closer to Spring Bay. Earlier in the season they are usually more green in color. 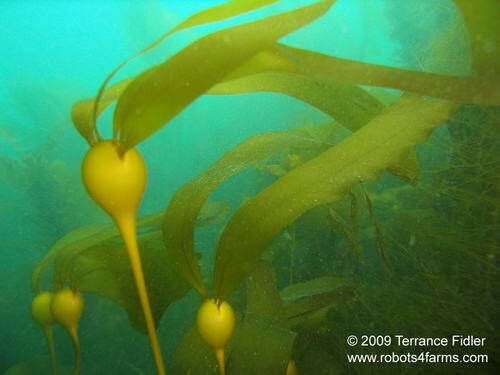 the top of the Sea Sac keeps them standing upright.